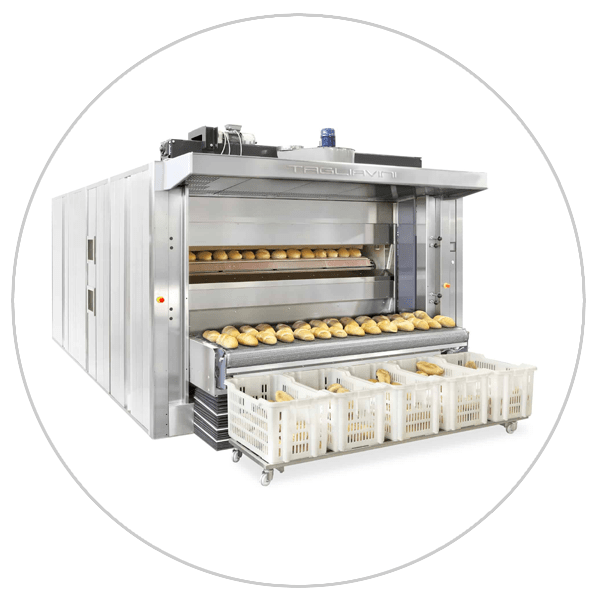 2 row continuous divider/rounder with programmable touchscreen controls, and available roll moulding unit. 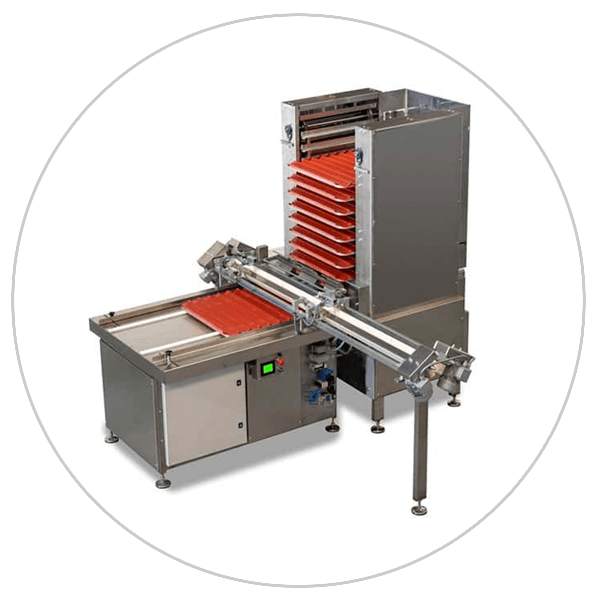 Industry-leading continuous, automatic divider rounders typically available in 4 - 6 row configurationsl completely remanufactured by our experienced team. 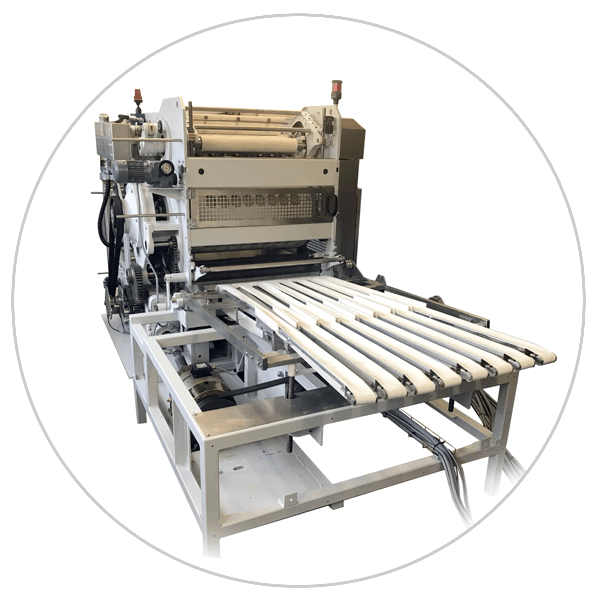 Industrial, automatic divider/rounder suitable for continuous production via our Winkler Admiral remanufacturing program. 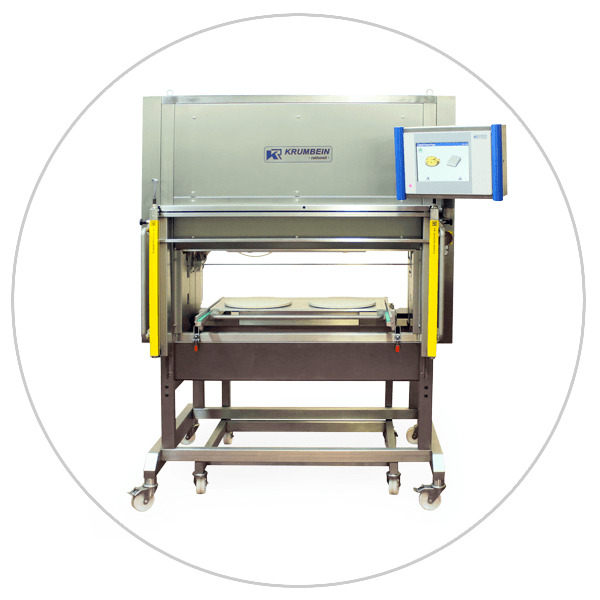 Hydraulic dough divider with optional division expansions and Tradiform configuration. 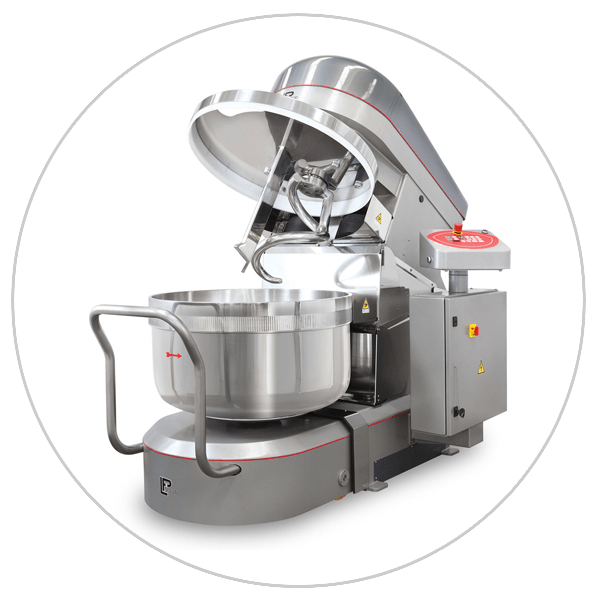 Dough divider with 2-5 pistons, adjustable weight range, with available pre-rounder. 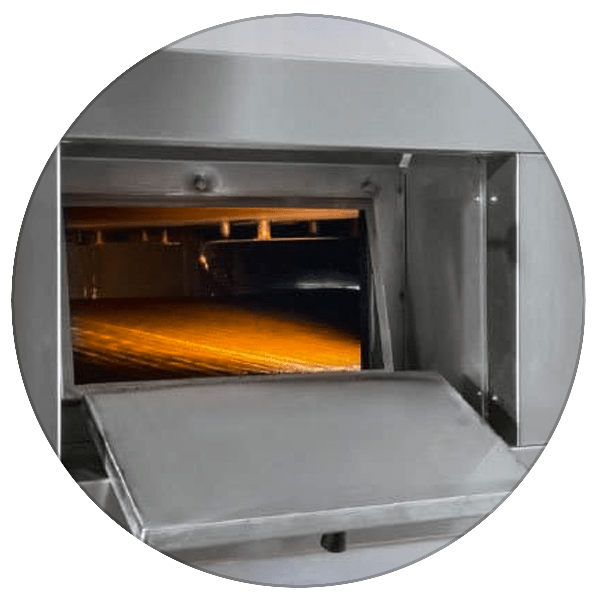 Volumetric divider suitable fermented, gaseous artisan style bread doughs. 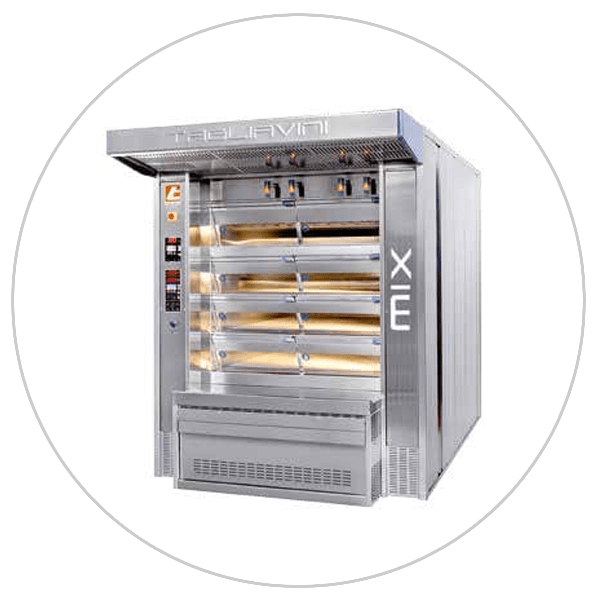 Band style rounder suitable for high hydration, artisan-style bread doughs. 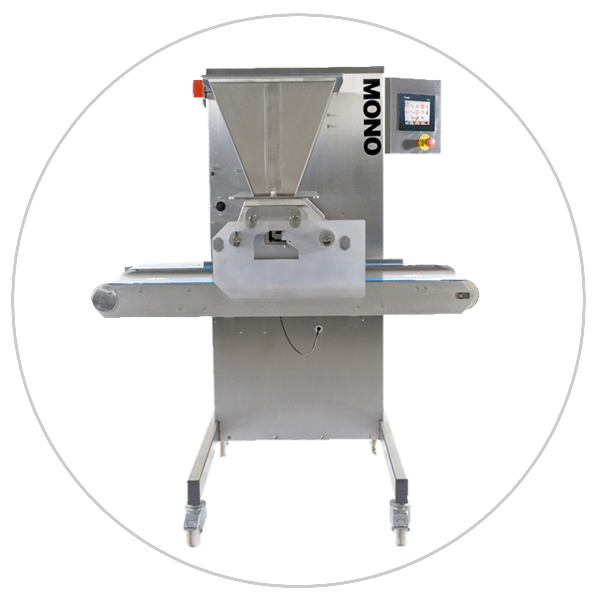 Moulder for making Mexican Bolillos, hoagies, sub rolls, and hot dog buns. 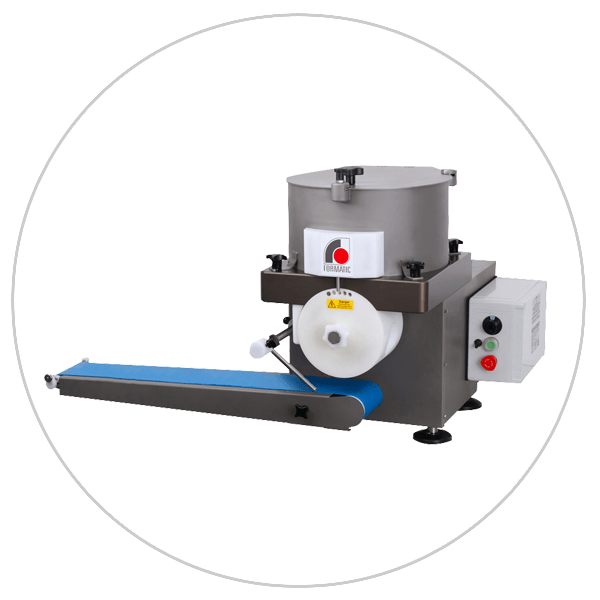 Bread moulder suitable for forming Baguettes, French & Italian bread. 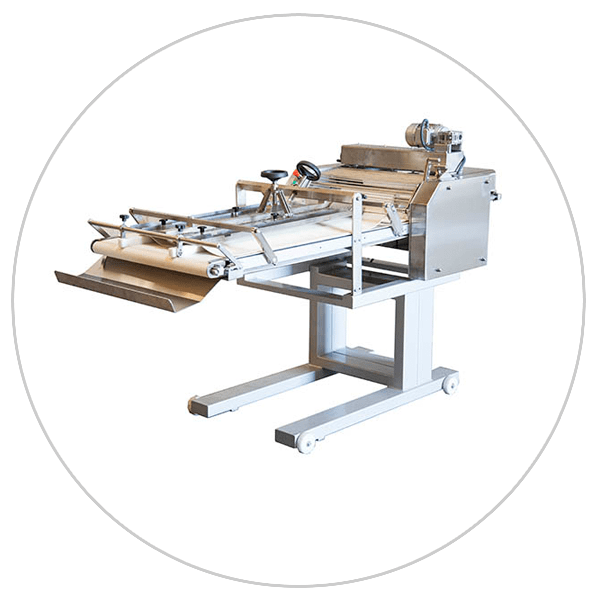 Moulder for making French Baguettes, French & Italian Bread, and batards. 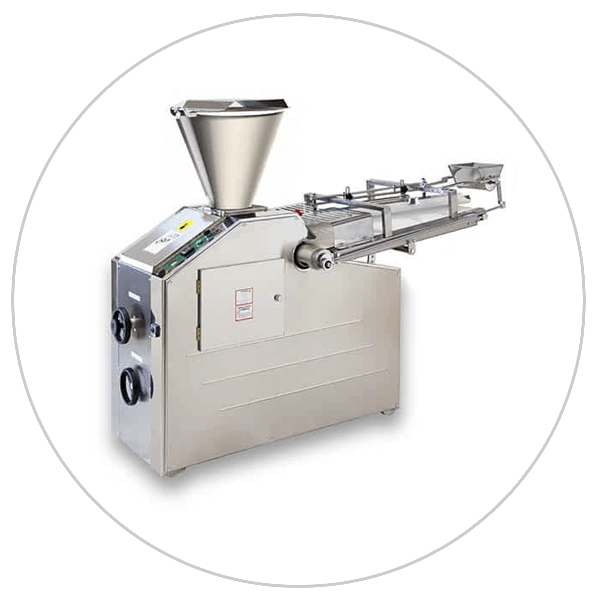 Moulder for making Mexican Teleras and Portuguese Rolls (papo secos). 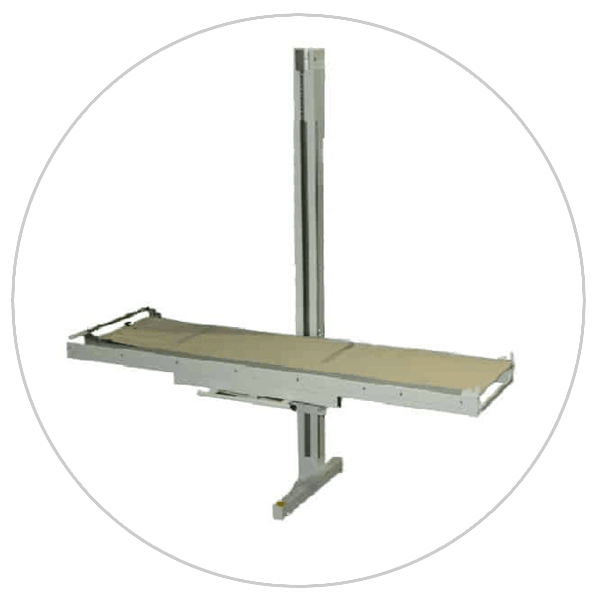 Highly customizable, dynamic & static proofing systems built to your specifications. 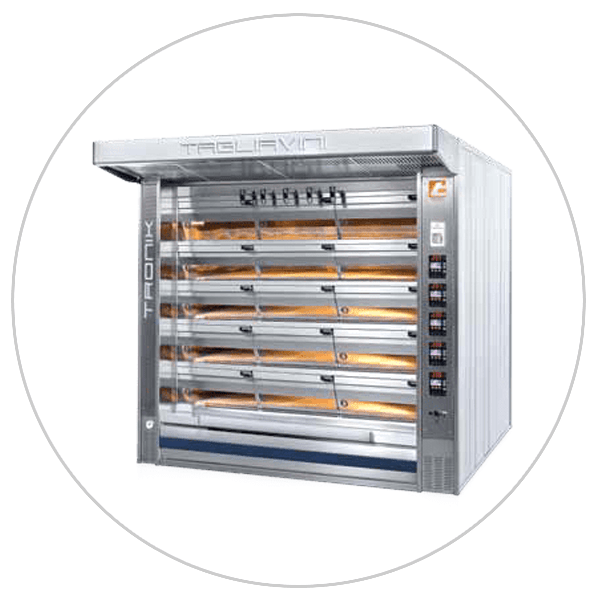 Automatically pan/tray loaves of bread, using a system built to your specifications. 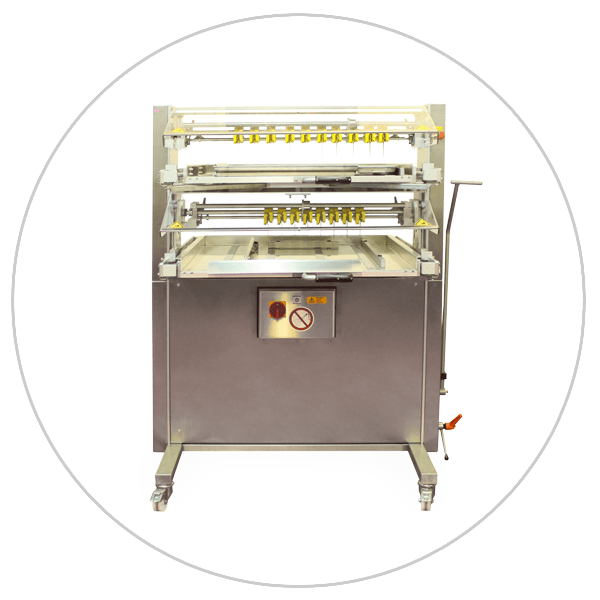 Tabletop confectionery depositor perfect for French Macarons, cupcakes, sheet cakes and more! 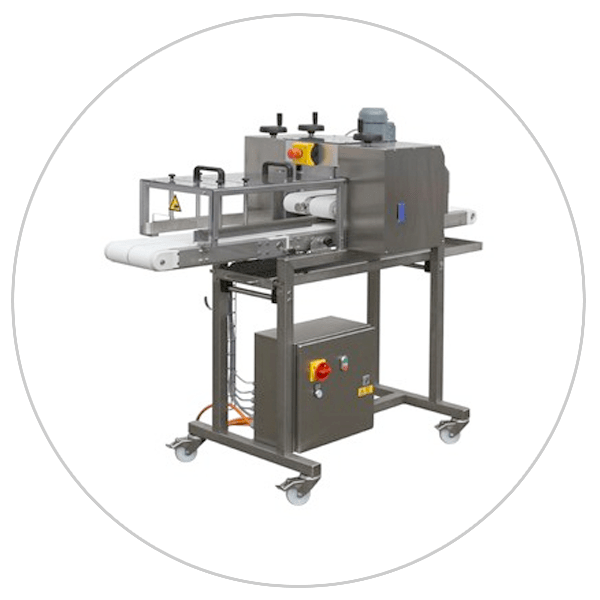 Confectionery depositor with rotary configuration perfect for a wide variety of products. 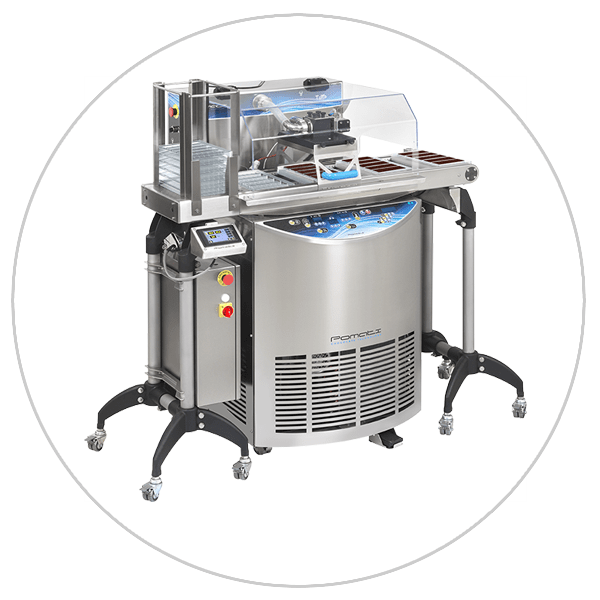 Confectionery depositor with rotary and added wirecut capabilities for cookies! 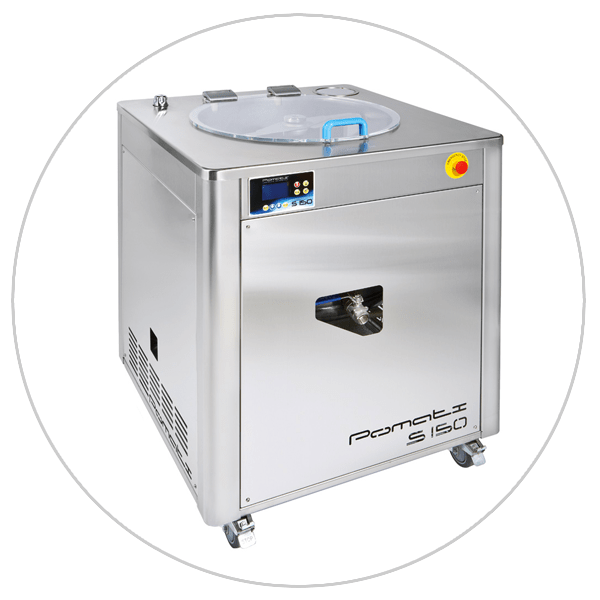 Rotary cookie machine for creating embossed/imprinted cookies. 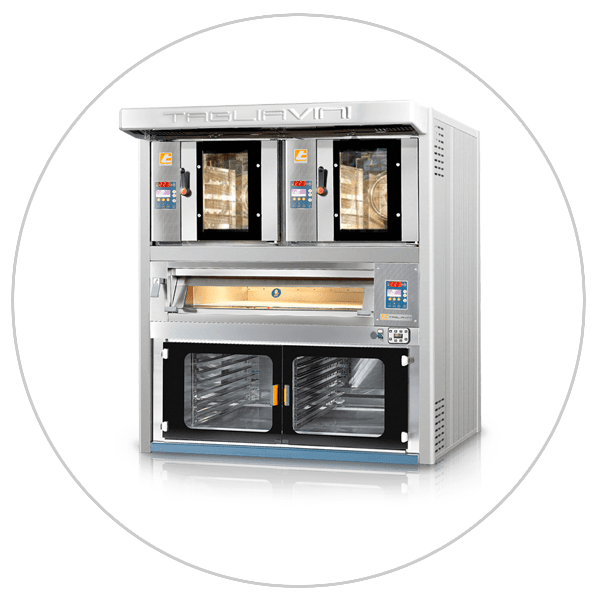 Suitable for butter and short dough style cookie dough. 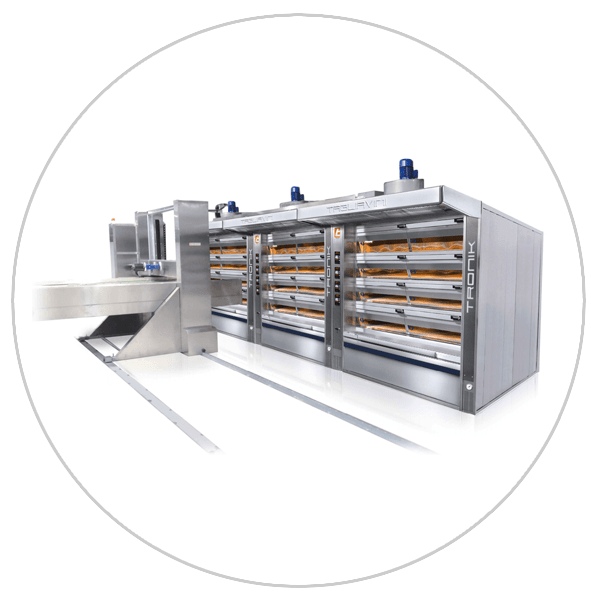 Wire-release cookie machine for doughs with and without large particulates, capable of producing custom shapes. 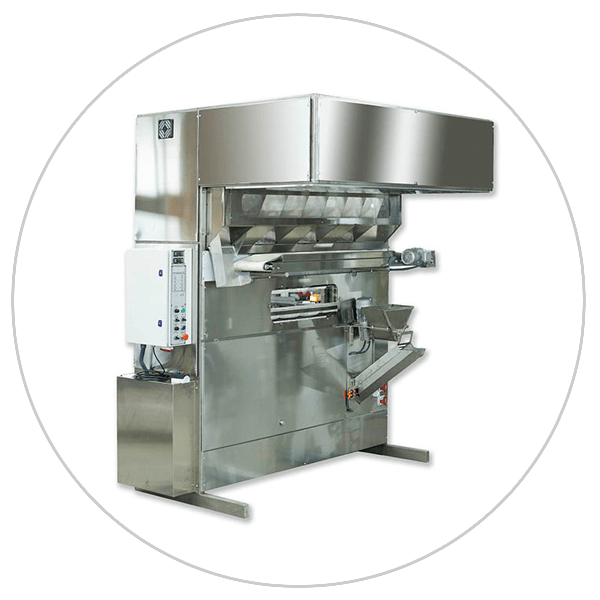 Wire-release cookie machine for doughs with and without large particulates, capable of producing custom shapes, with automatic panning. 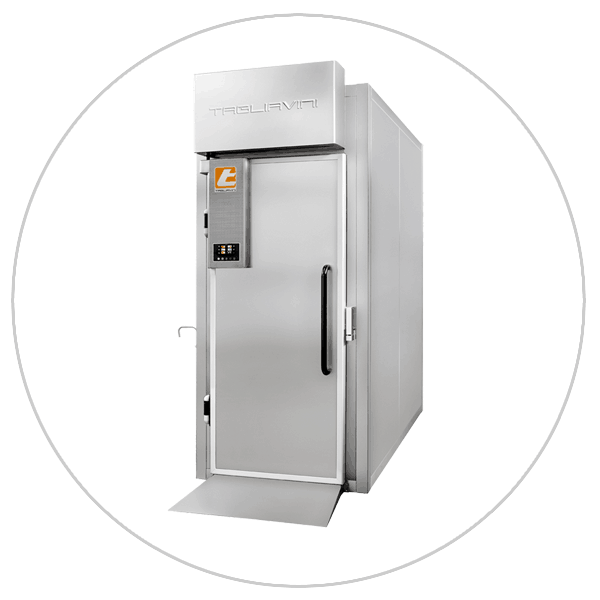 Ideal for retail bakeries that only need to address dough portioning. 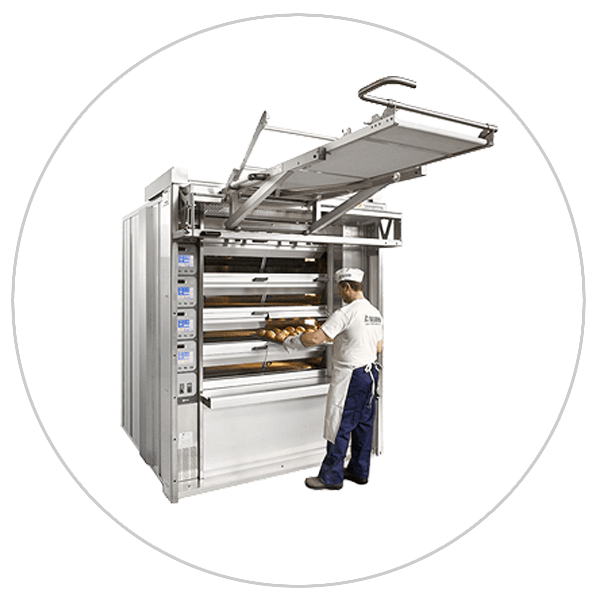 Ideal for retail bakeries that are making multiple products. 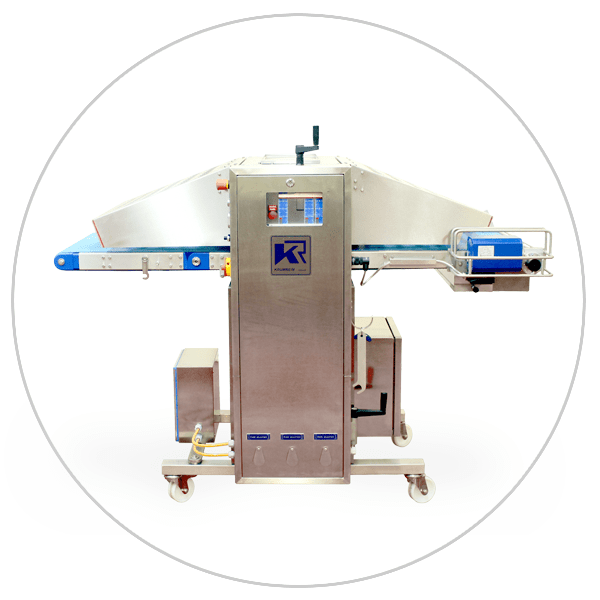 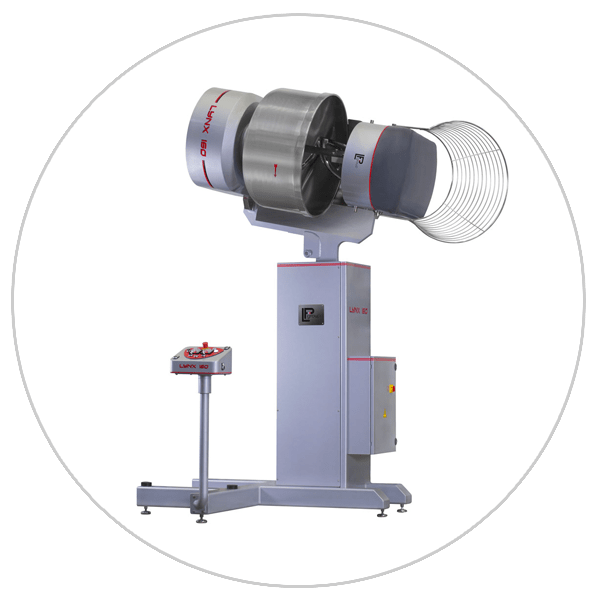 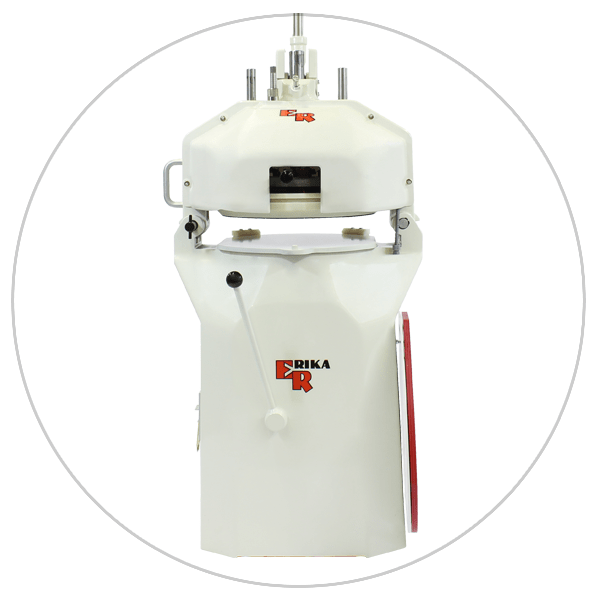 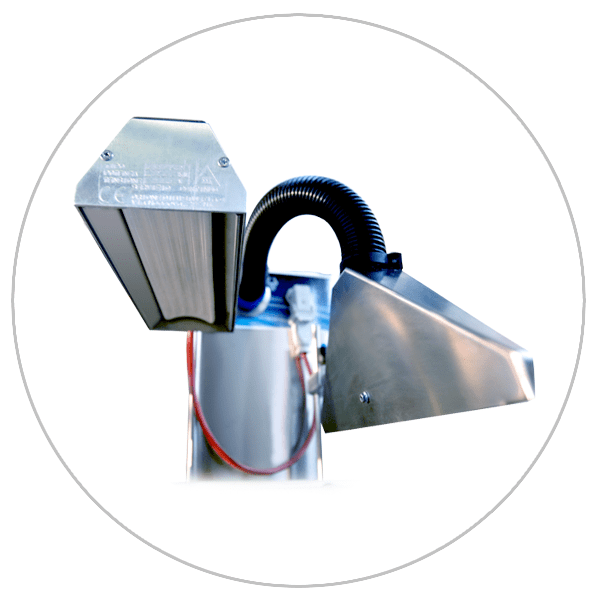 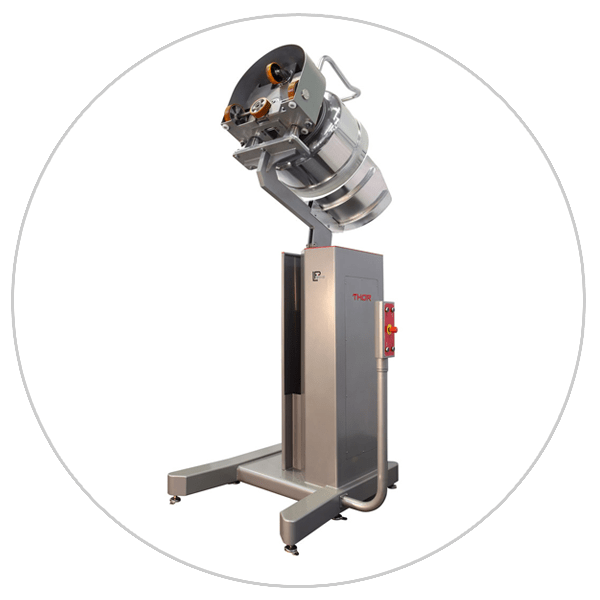 These models can process multiple weight ranges in one machine, using our innovative removable knife head assembly (KHA) system. 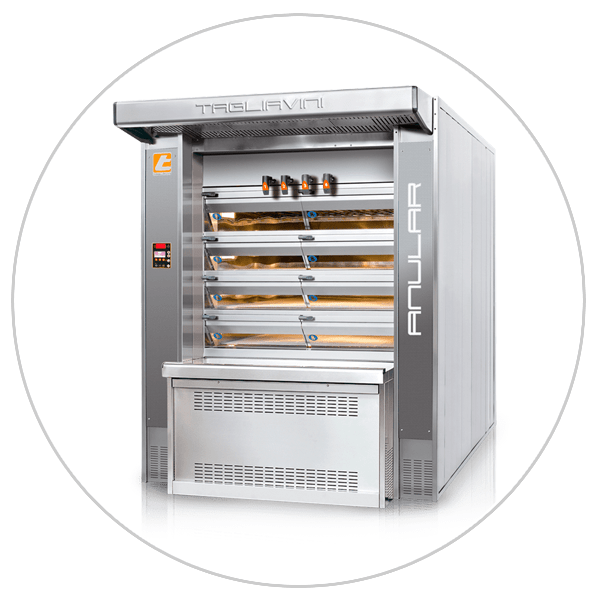 Ideal for retail and emerging wholesale bakeries that are making large quantities of the same products. 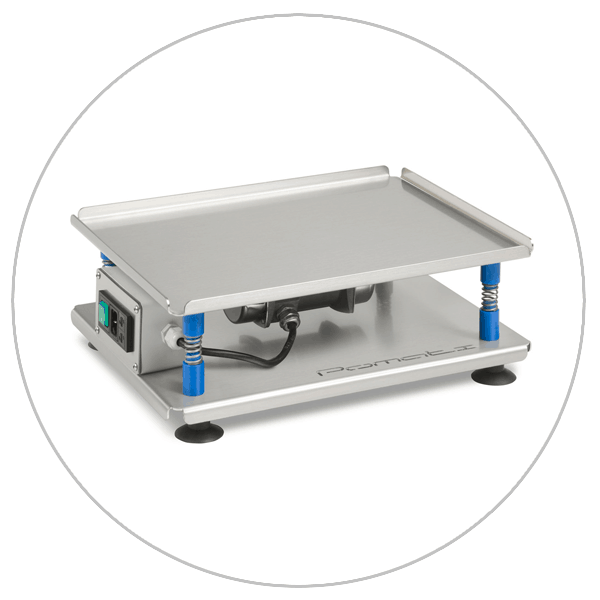 These models feature streamlined operation for improved production flow. 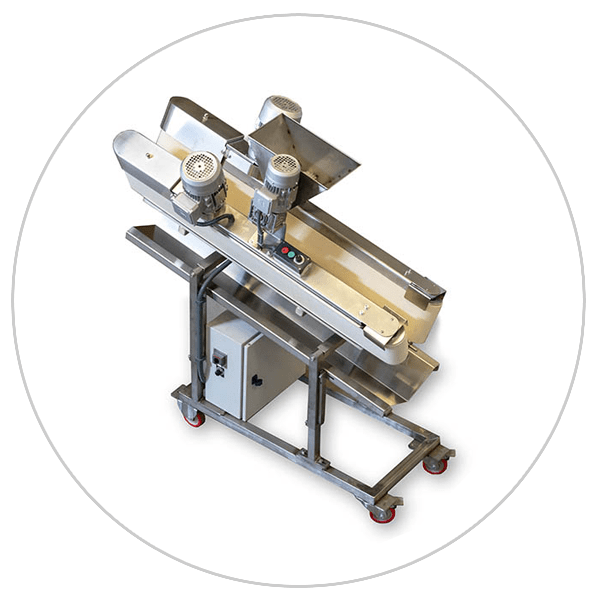 A manual hand divider capable of equally portioning dough into 15 or 36 pieces. 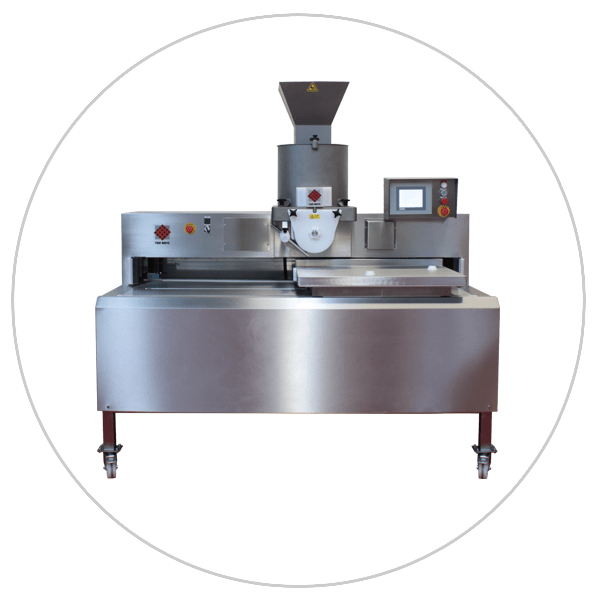 Our entry level model, this semi-automatic divider/rounder is designed to accurately portion and perfectly round dough each and every time. 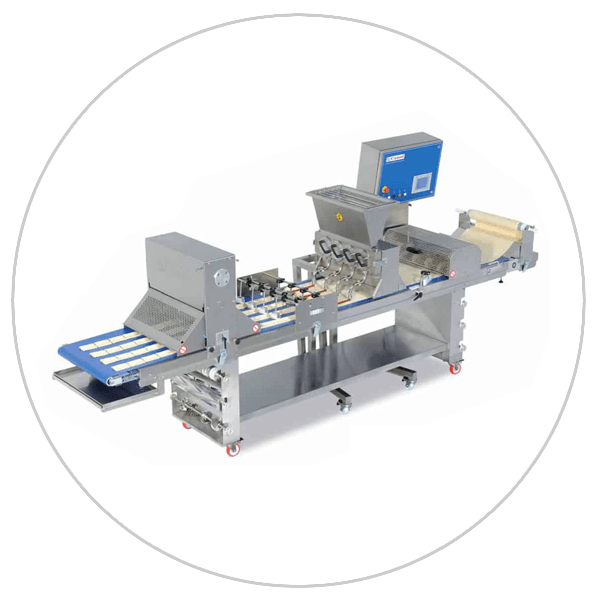 The Full features automated processing of dough via dual button operation; with lowering of the knife head assembly, pressing, dividing, and rounding of dough achieved within seconds. 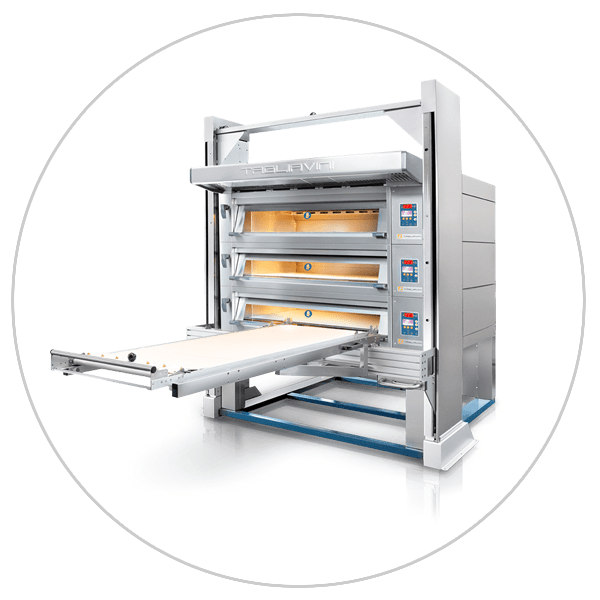 For bakeries producing square or rectangular products, we also offer the Quadro Series configuration. 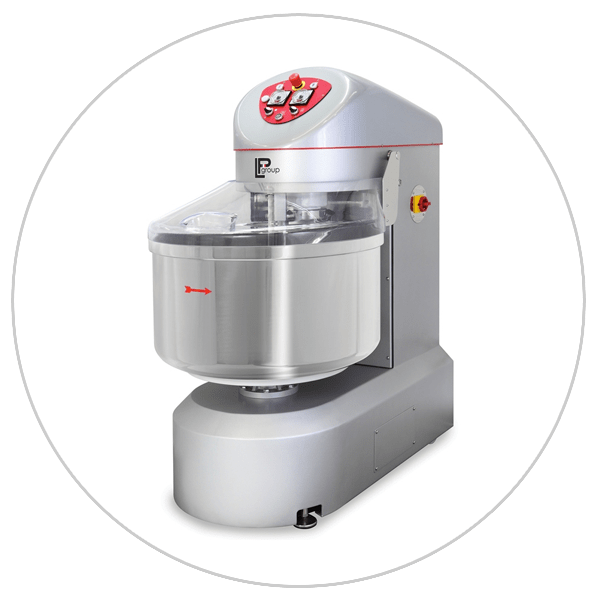 The Easy makes pressing dough easier, with automated lowering of the knife head assembly and pressing of the dough. 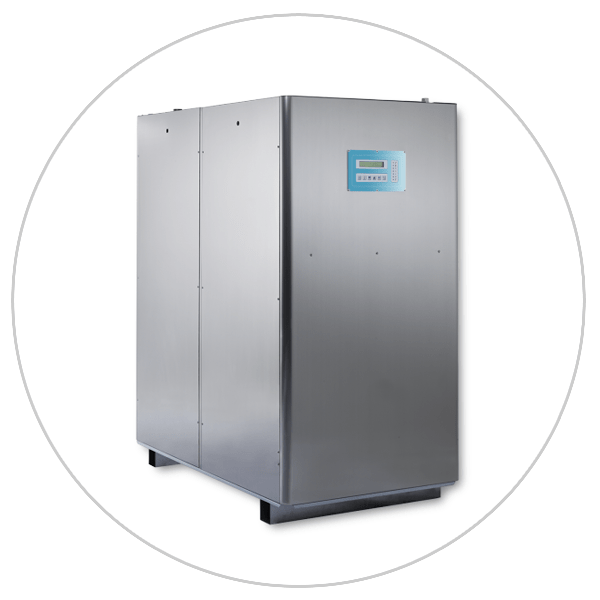 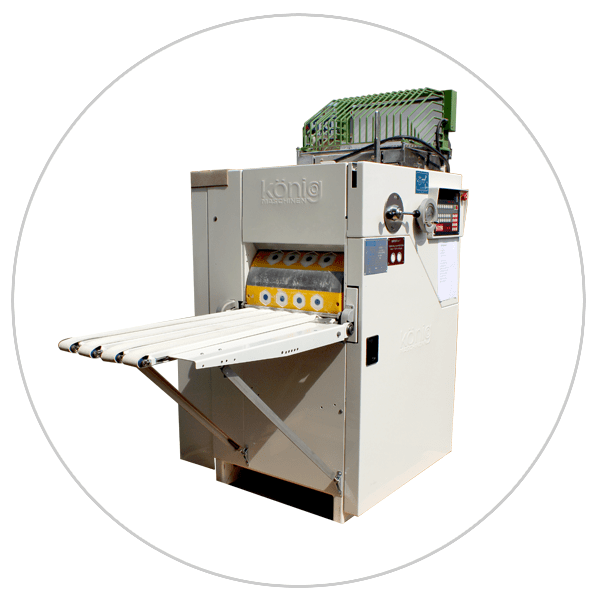 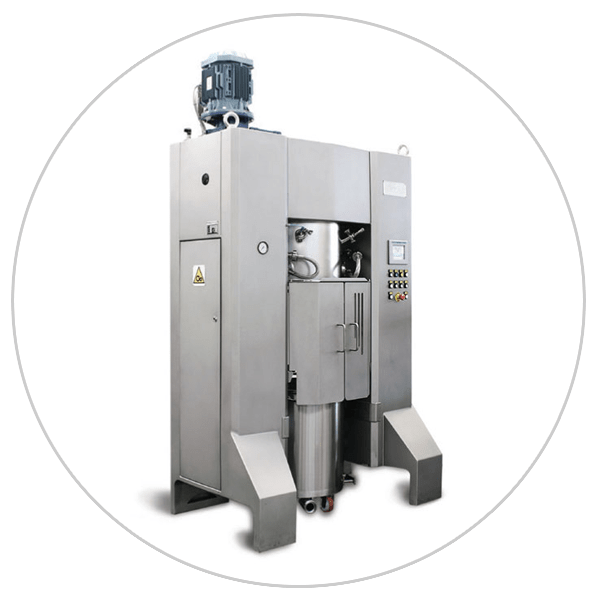 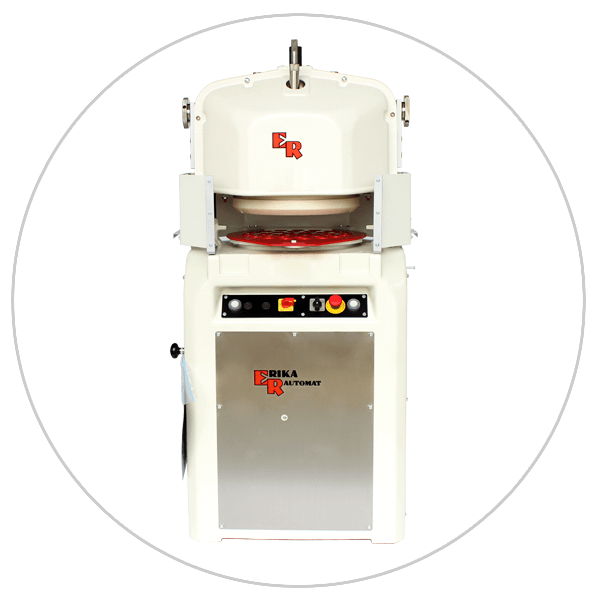 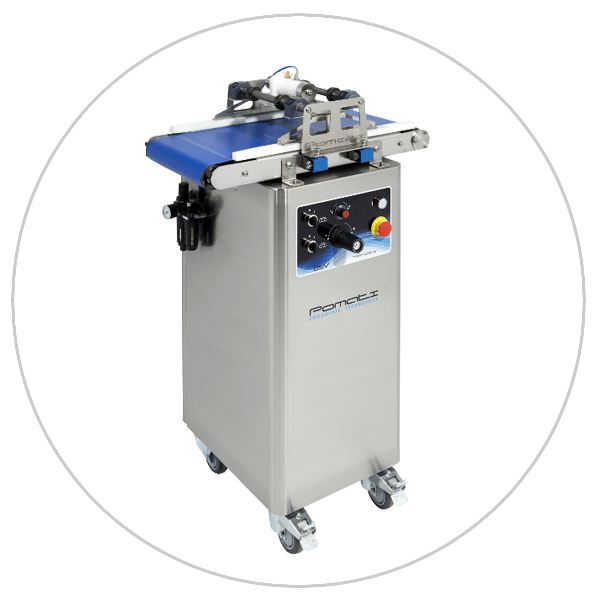 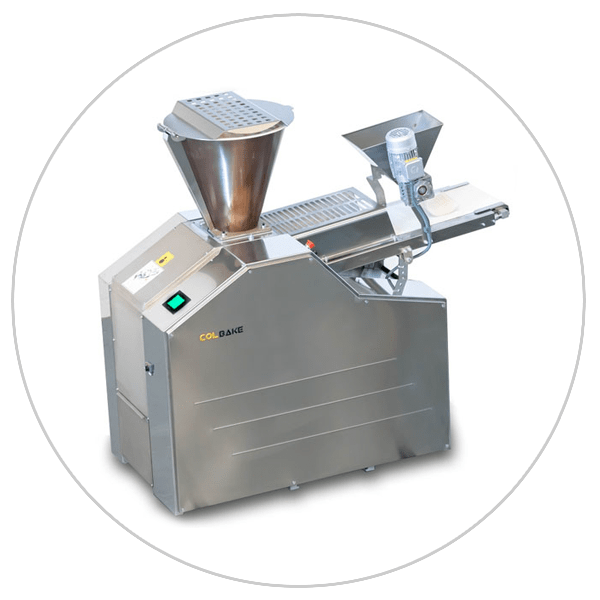 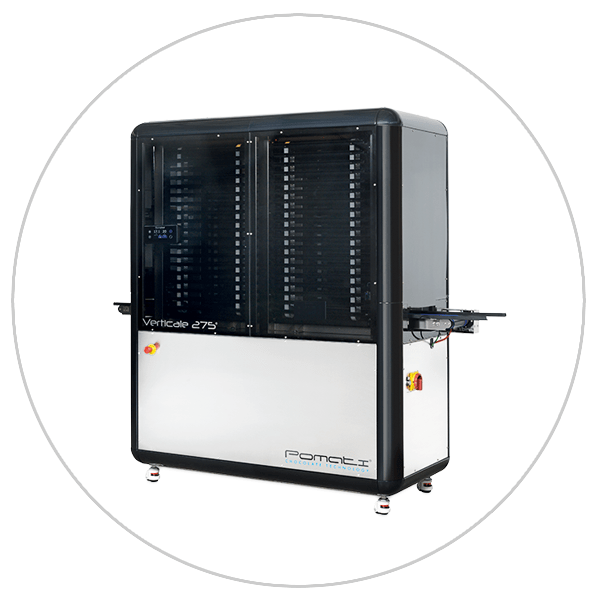 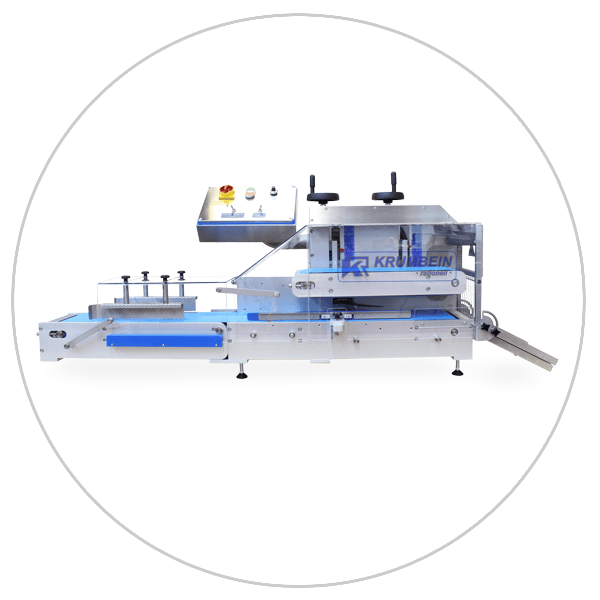 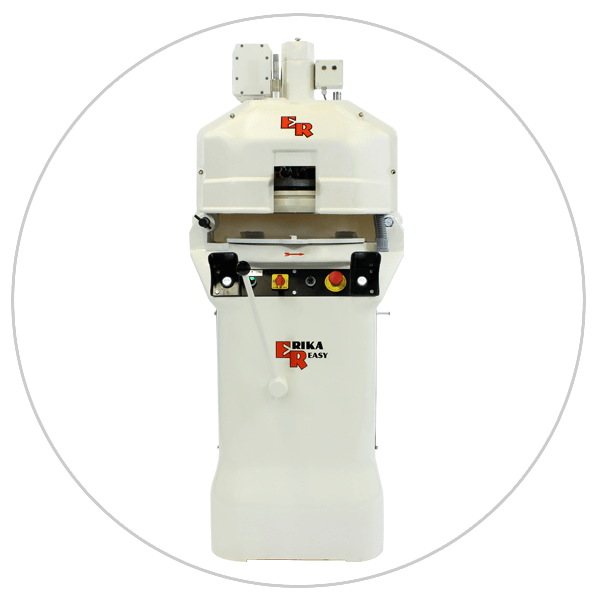 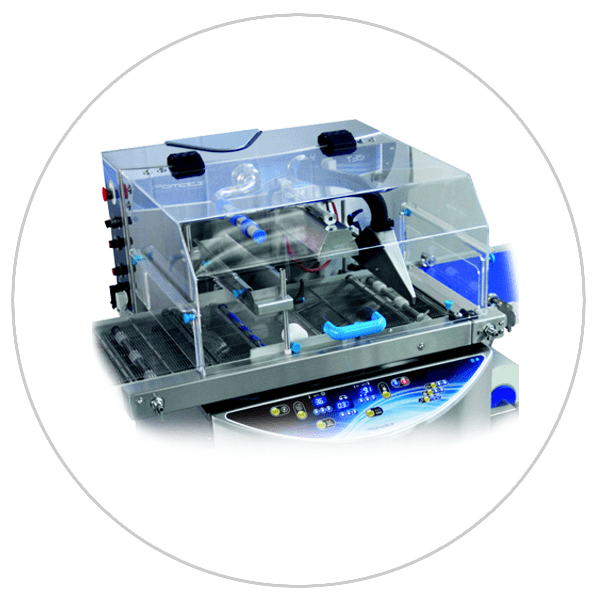 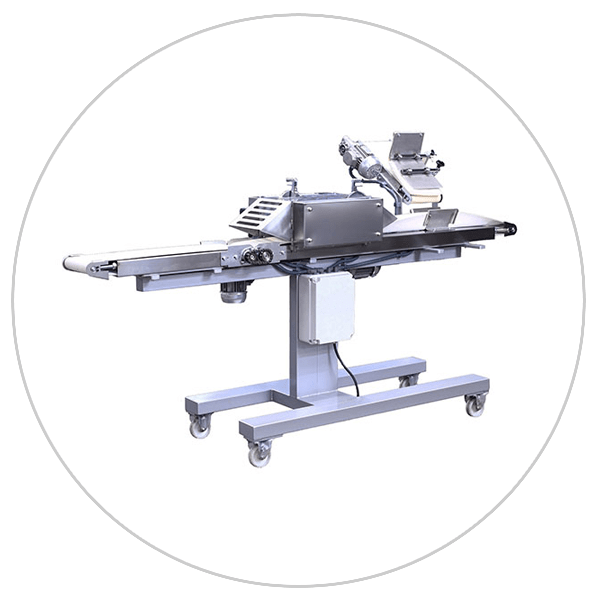 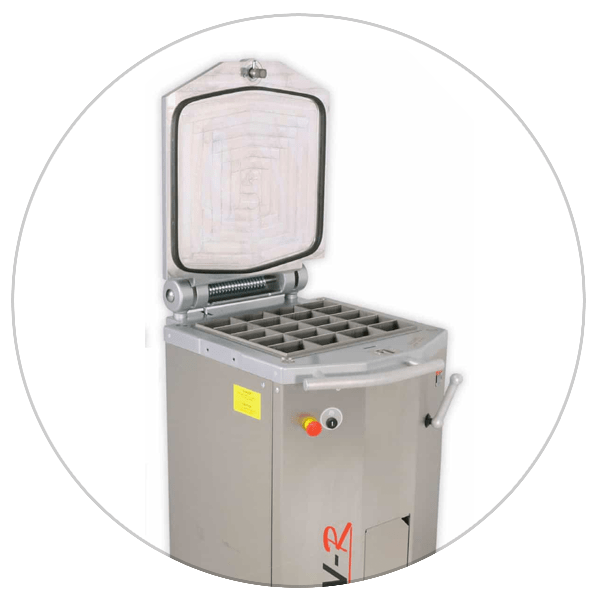 The Full Classic features complete automation of the pressing, dividing, and rounding process, achieved within second and requiring no user intervention. 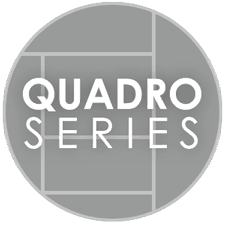 The Quadro Series is available across our entire lineup and faciltates production of both round and rectangular products such a ciabatta. 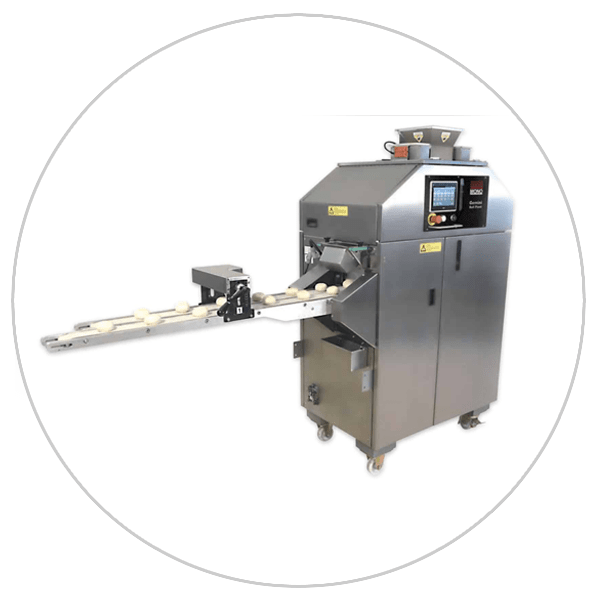 The Easy Plus makes processing even easier, with automated lowering of the knife head assembly, pressing, and dividing of the dough. 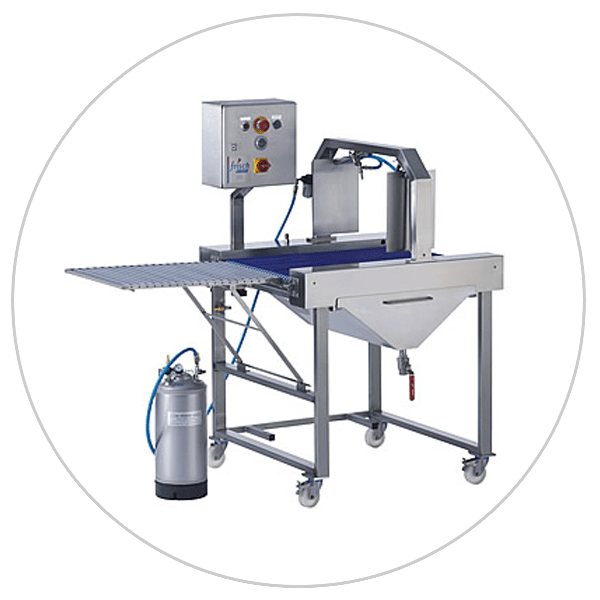 Egg washing and pan greasing system designed to accurately apply product and minimize waste. 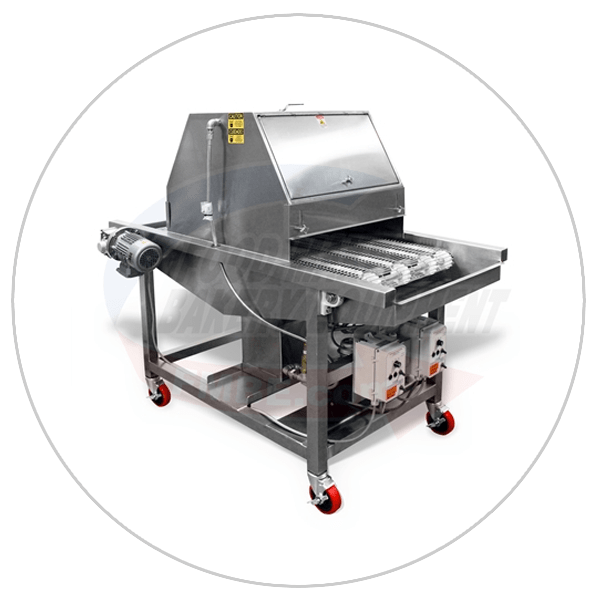 A durable, customizable and affordable egg washing and pan greasing system. 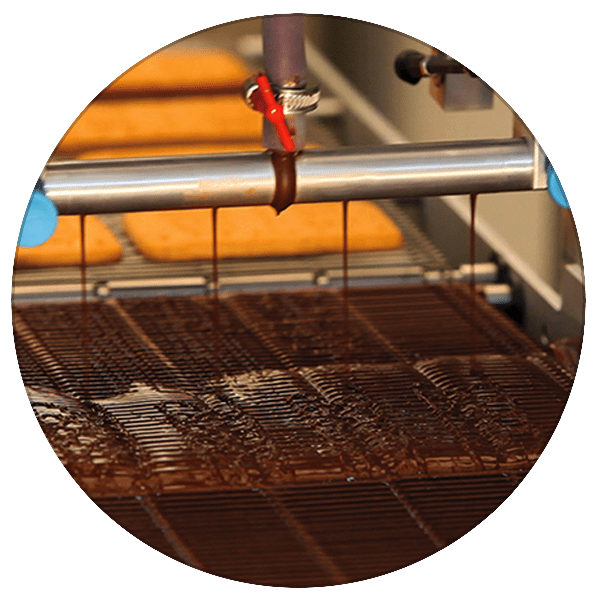 Highly accurate glazing and enrobing system for application of chocolate, icing, fondant and more. 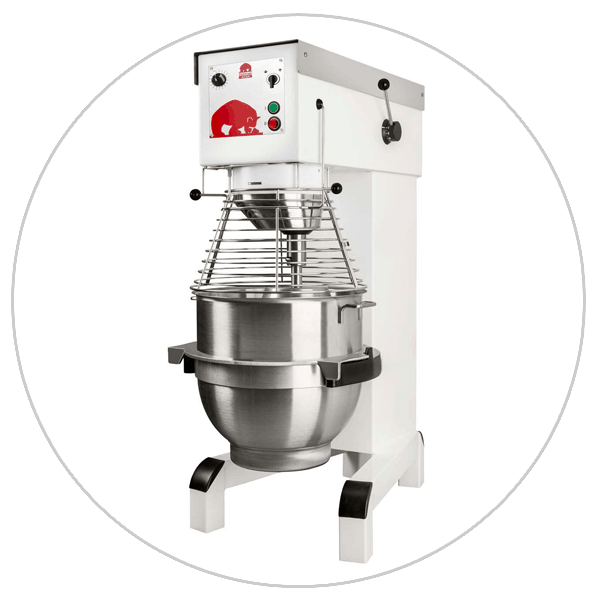 Planetary mixers available in 20, 30, 40, 60, and 80 quart capacities. 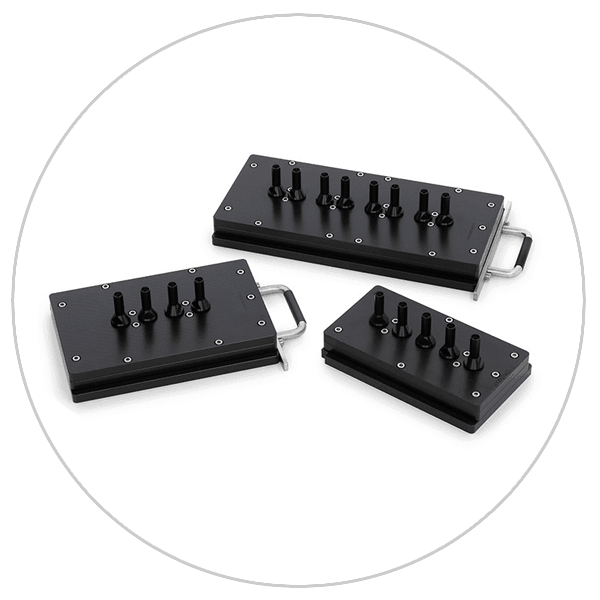 Programmable options available. 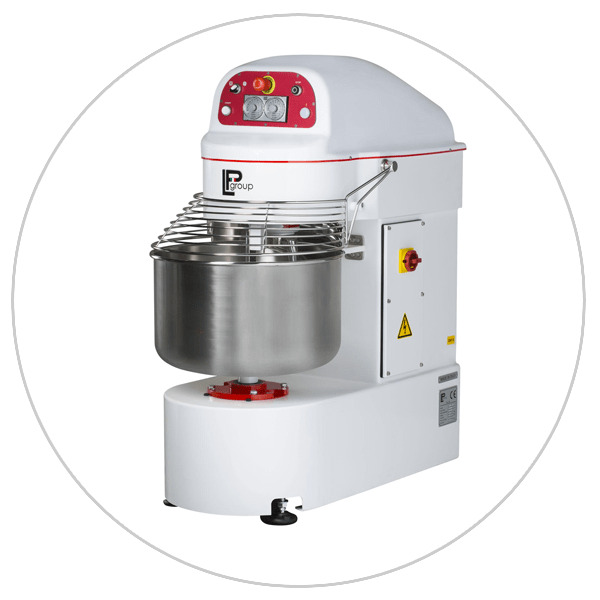 High capacity planetary mixer with a wide assortment of available attachments. 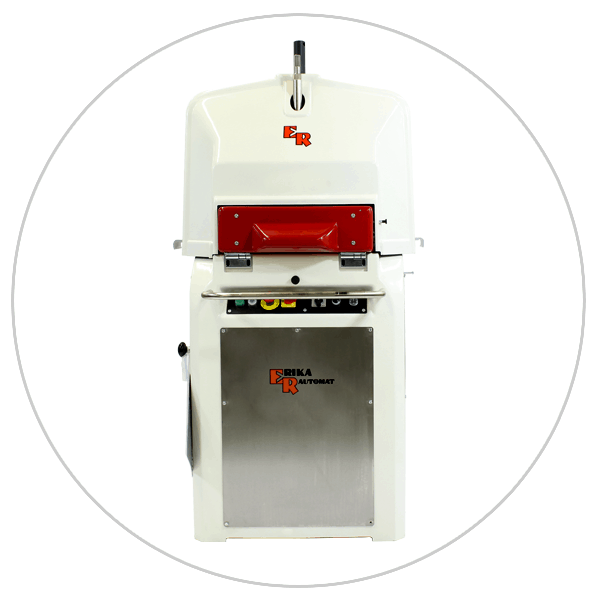 A high capacity, ergonomic approach to mixing with programmable controls located at eye-level. 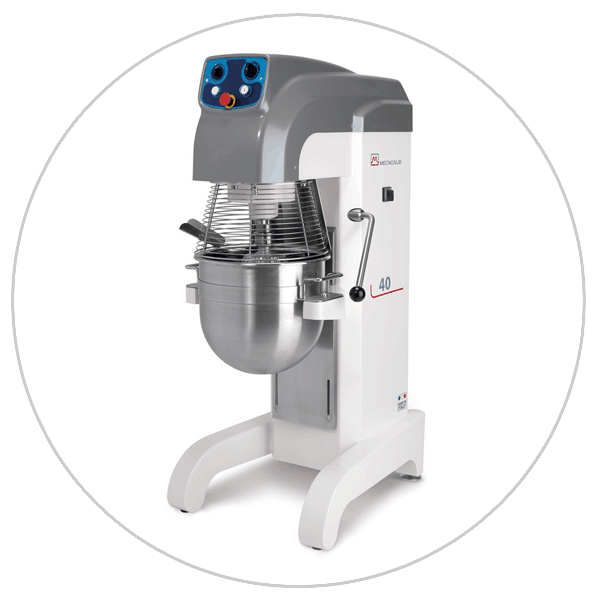 Fork mixer with removable grid cover, suitable for artisan dough production. 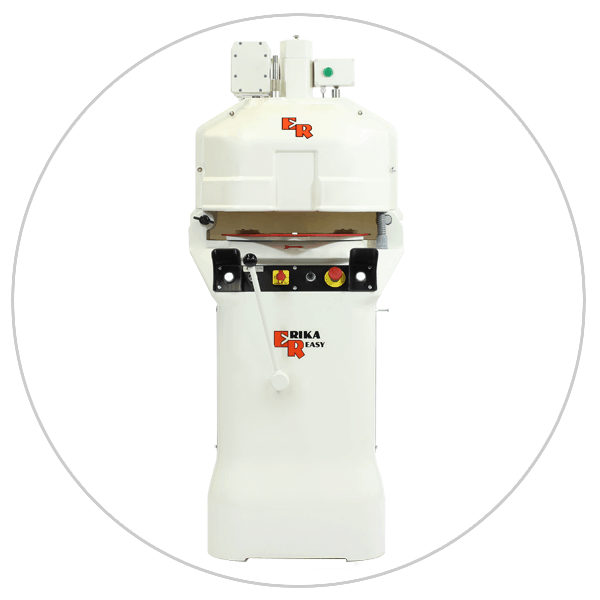 High capacity, twin tool planetary mixer that can be incorporated into large scale production. 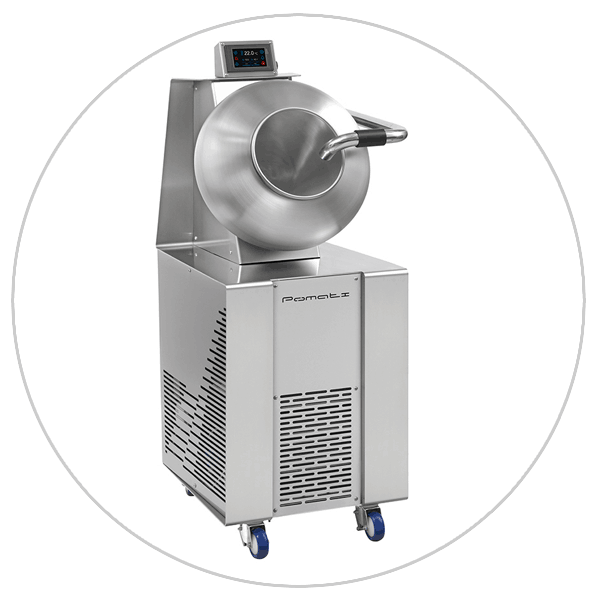 Ingredient handling and product transfer systems are also availabe. 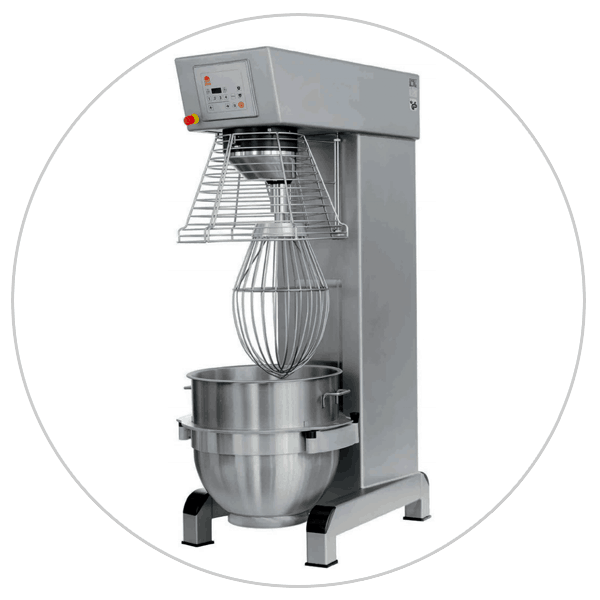 A reinforced, entry-level spiral mixer for limited production. 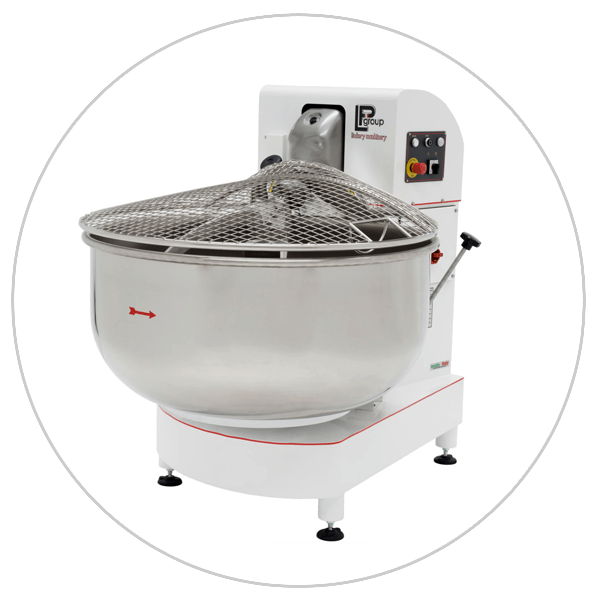 Reinforced, fixed bowl spiral mixer perfect for lower hydration doughs. 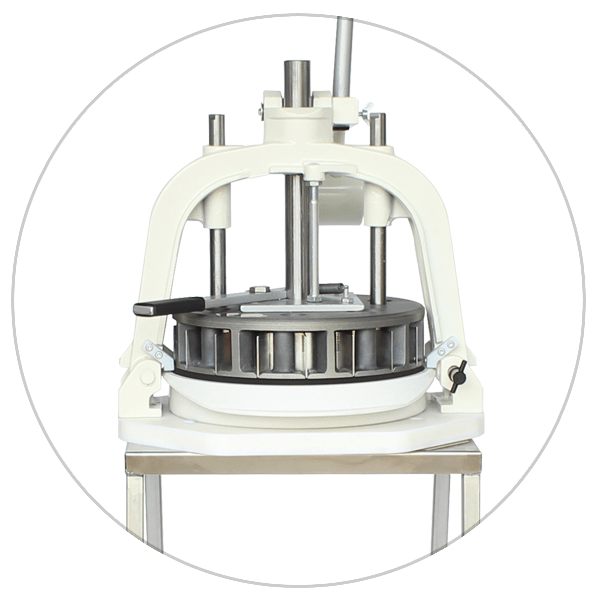 Reinforced, removable bowl spiral mixer perfect for lower hydration doughs. 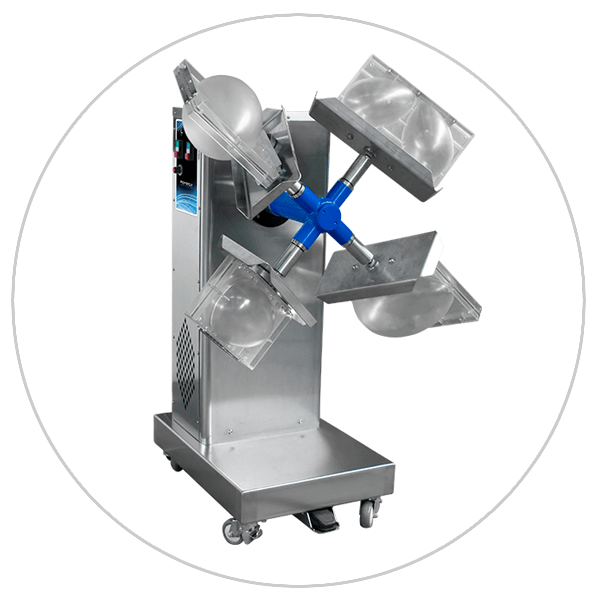 Reinforced, self tilting spiral mixer perfect for lower hydration doughs. 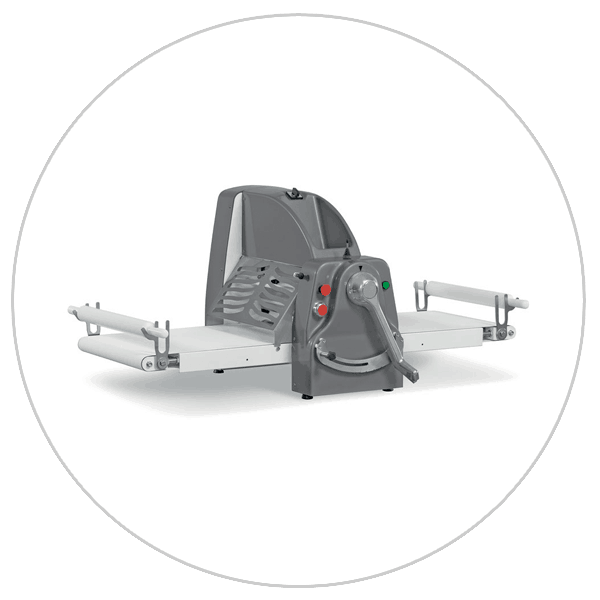 Bowl lift with available left, right, or dual side discharge configurations. 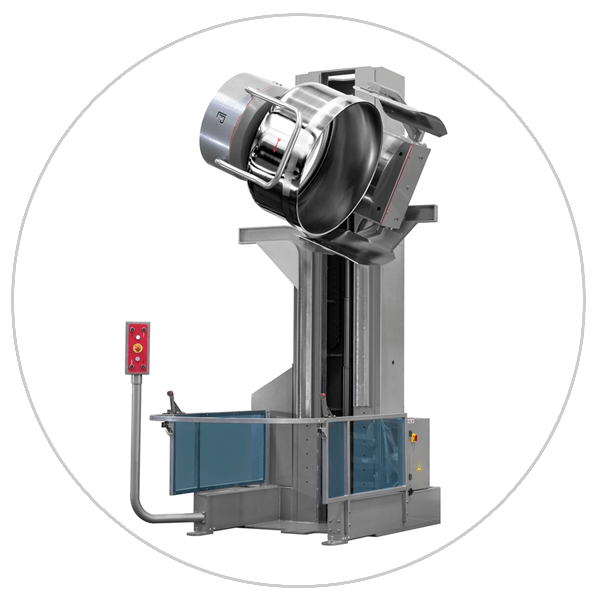 Overhead bowl lift with available discharge configurations at bench or hopper height. 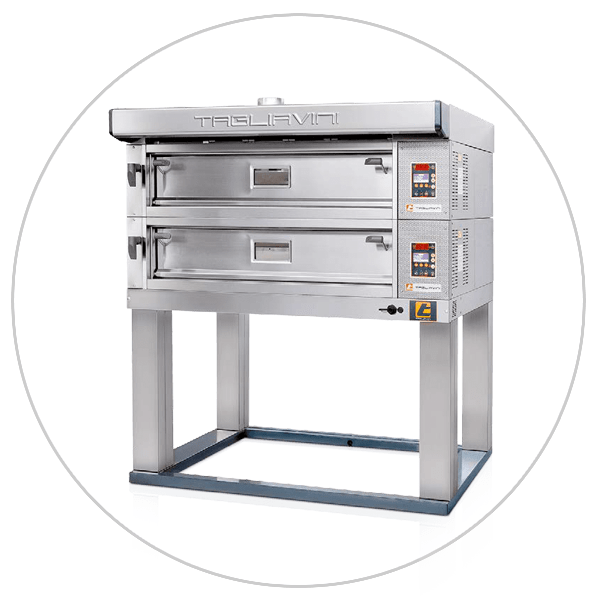 An efficient, reliable tunnel oven for industrial baking operations. 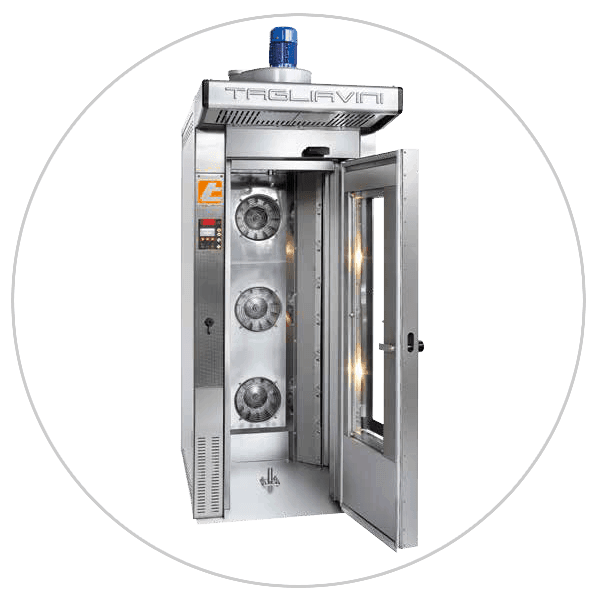 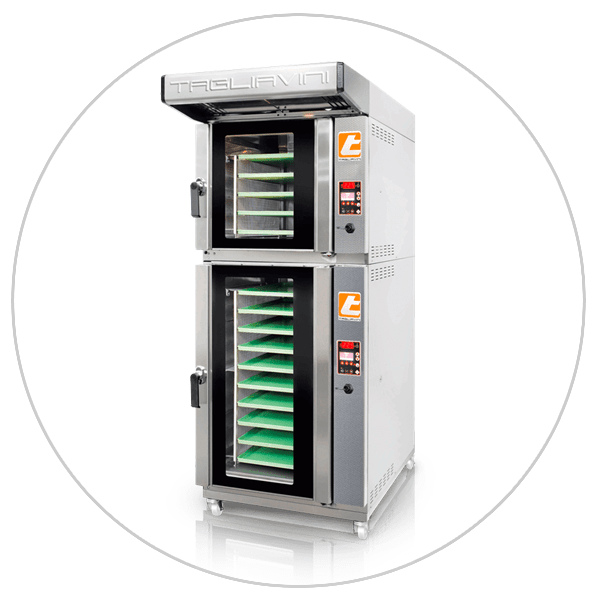 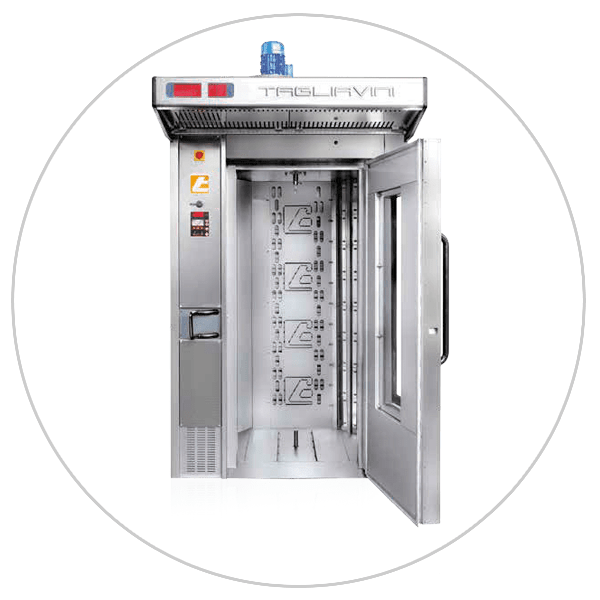 This oven is completely customized for your production needs and features the incorporation of turbulence zones for even baking. 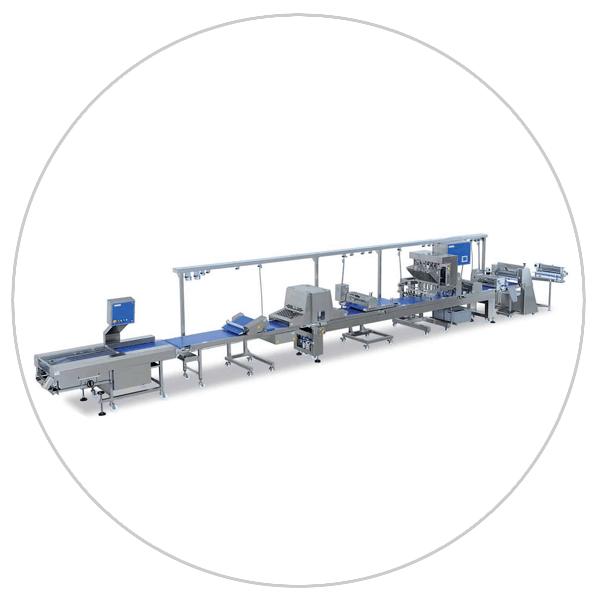 A compact pastry "make-up" production line with modular configurations for a variety of different pastries. 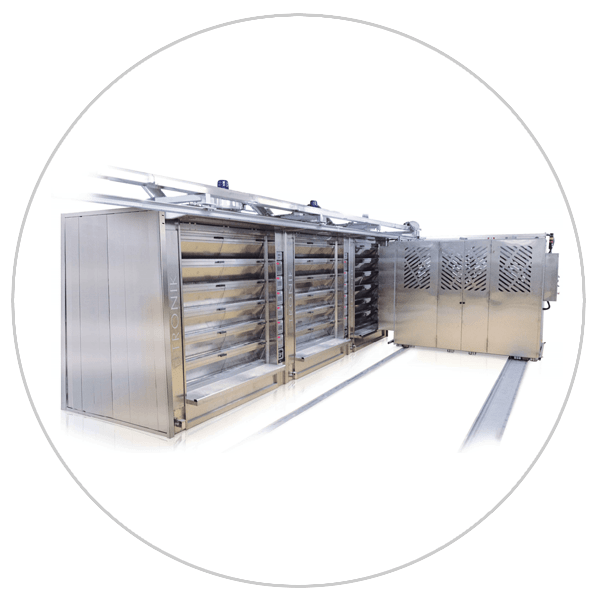 A complete, full fledged pastry "make-up" production line suitable for large scale pastry production. 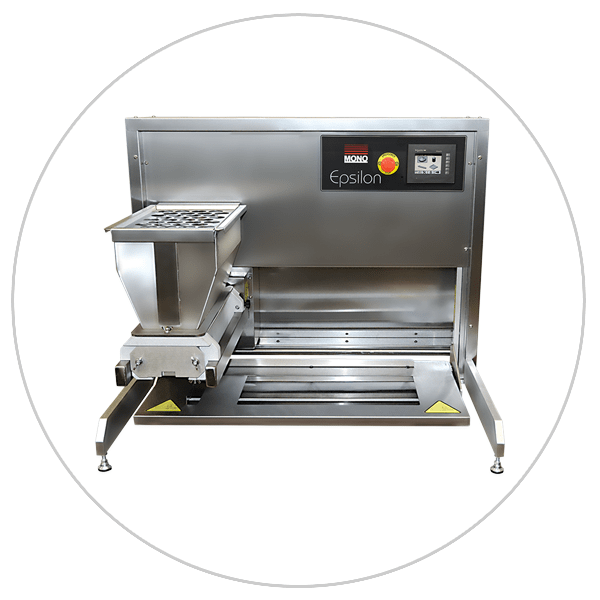 A compact, tabletop bread slicer ideal for retail bakeries. 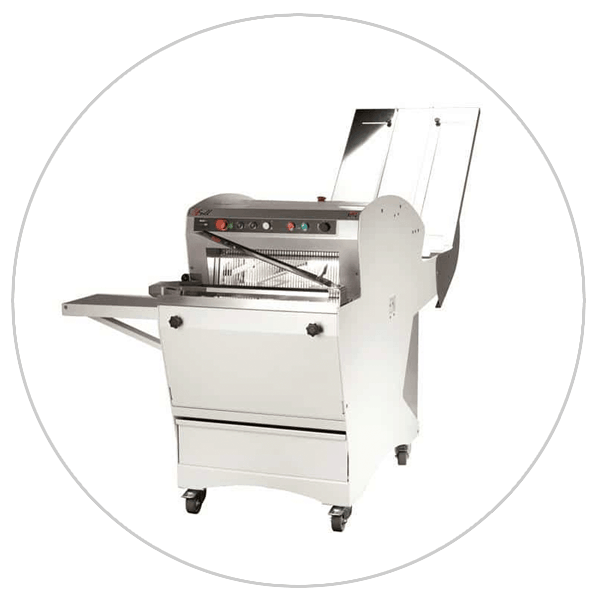 Jac's best selling bread slicer, fitted with casters for enhanced mobility. 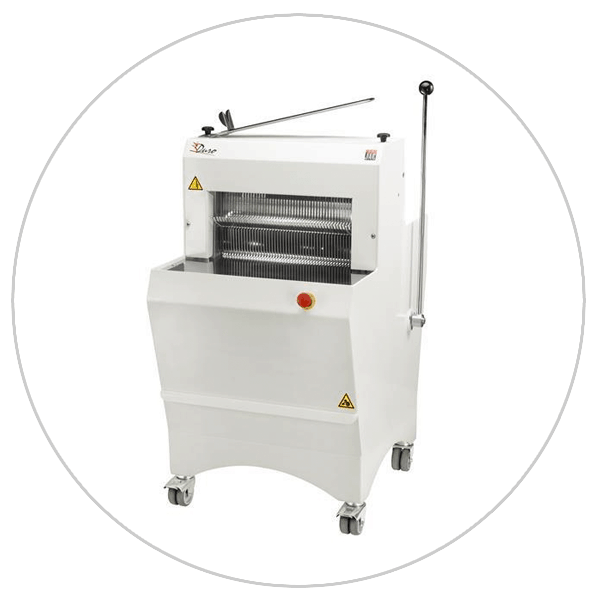 A high capacity bread slicer for emerging wholesale bakeries. 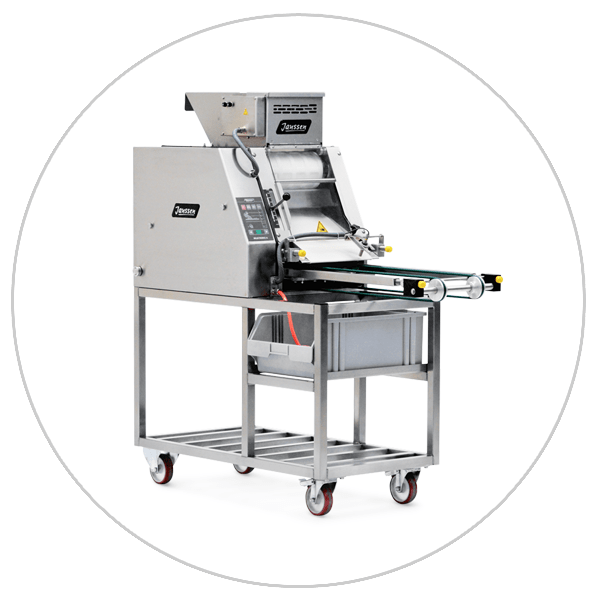 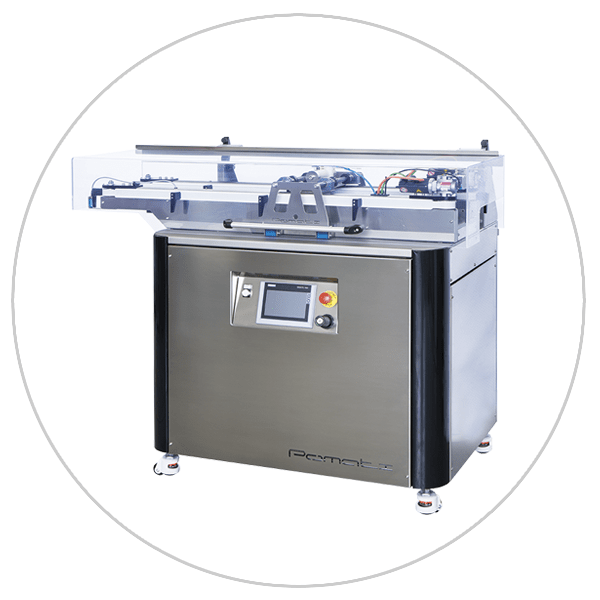 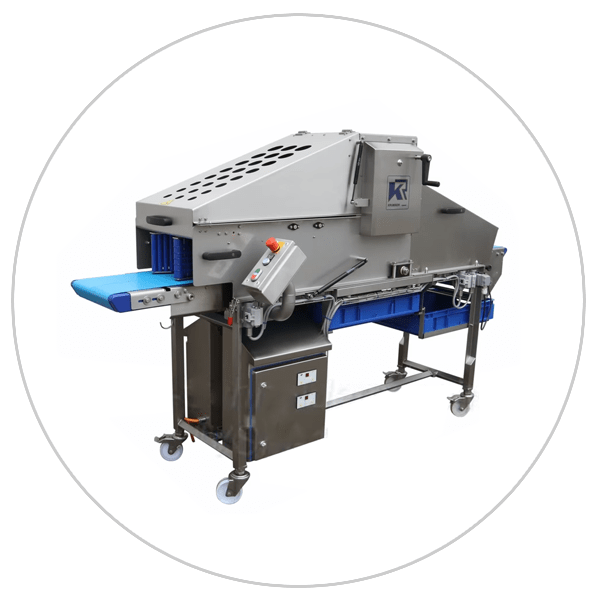 These bakery slicer solutions are ideal for high volume retail and emerging wholesale bakeries that are looking to streamline their processing needs; while minimizing the footprint required for processing. 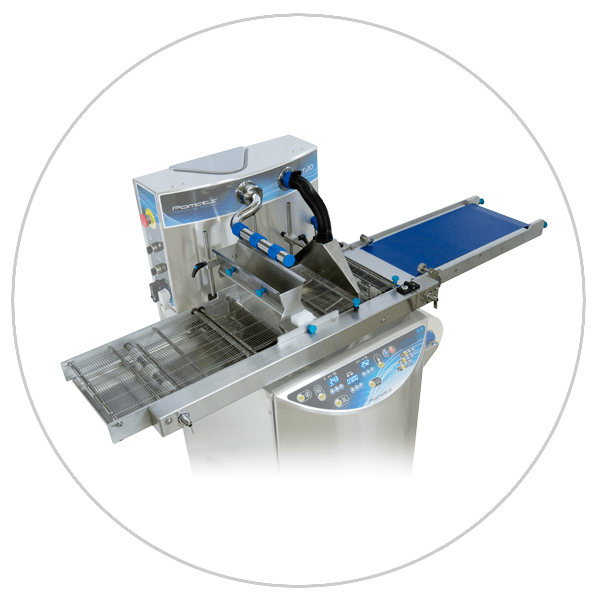 These bakery slicer solutions are ideal for commissaries and wholesale bakeries, currently processing large quantities of product. 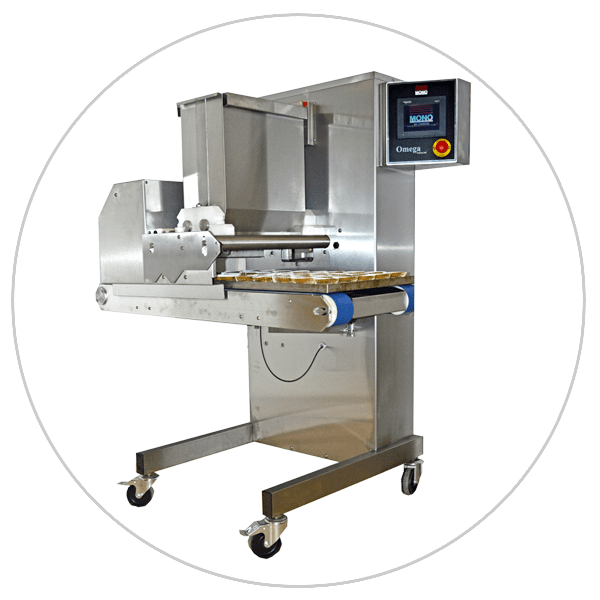 These bakery slicer solutions are ideal for commissaries and wholesale bakeries, currently processing large quantities of cakes or in-pan baked products. 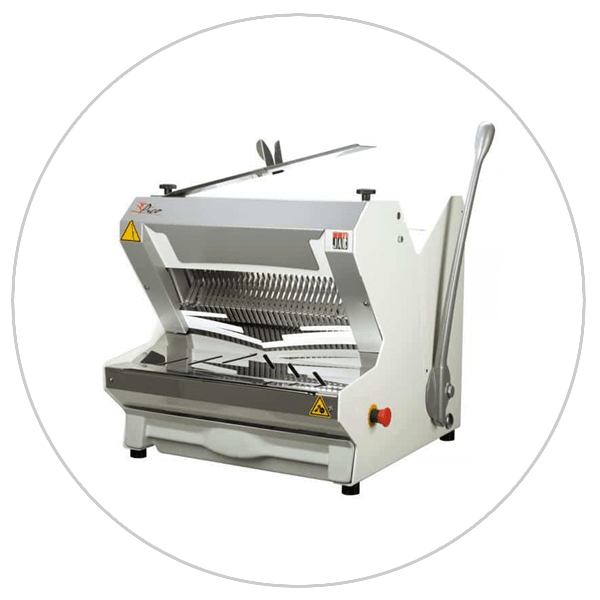 This slicer is perfect for slicing hinge style cuts in hoagies, hot dog rolls, hamburger buns, etc. 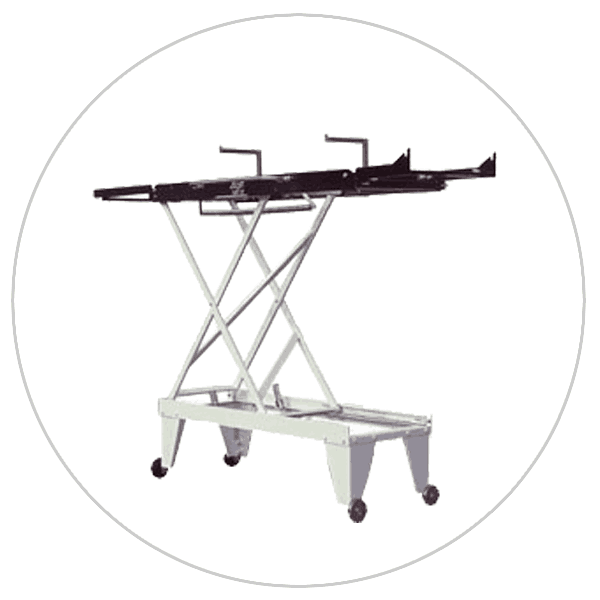 ; while also capable of making complete cuts. 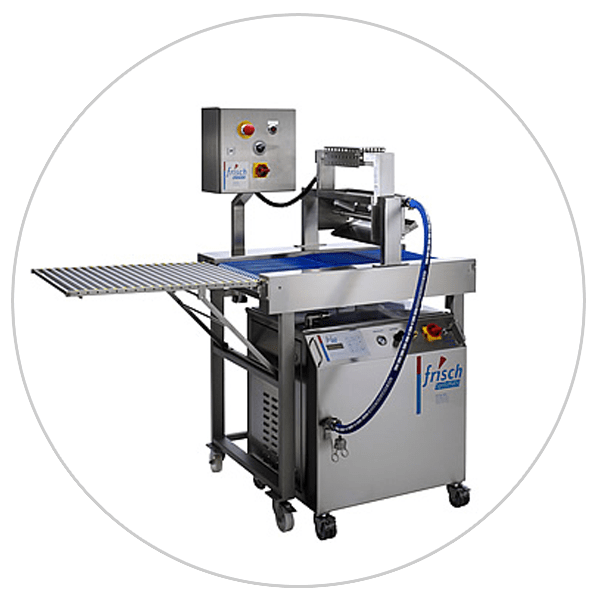 This slicer is is perfect for slicing cakes, rolls, bagels, sheet cakes and other baked goods in facilities with limited space. 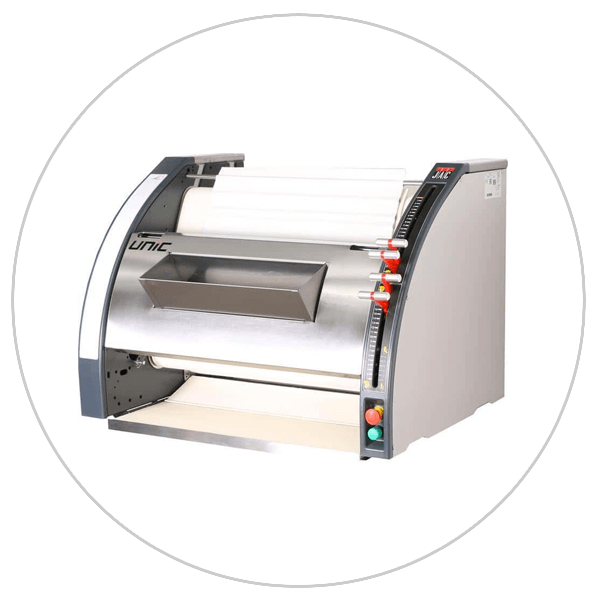 This slicer is perfect for slicing hinge style cuts in hoagies, hot dog rolls, hamburger buns, etc. 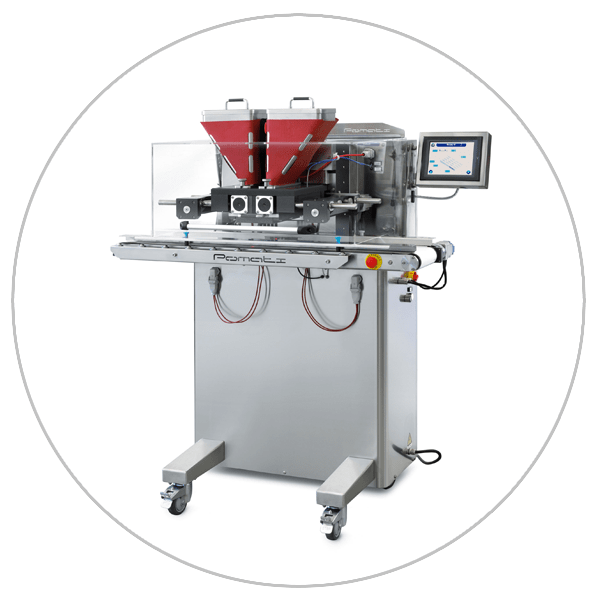 in mass-production environments. 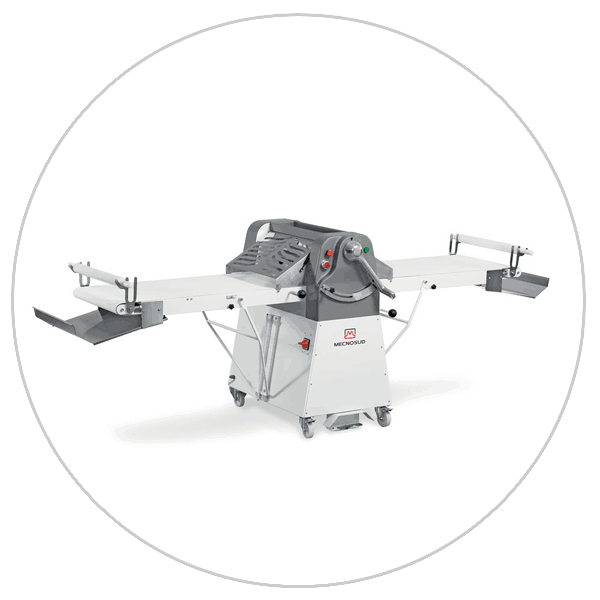 The slicer is also capable of making butterfly cuts on these very same products. 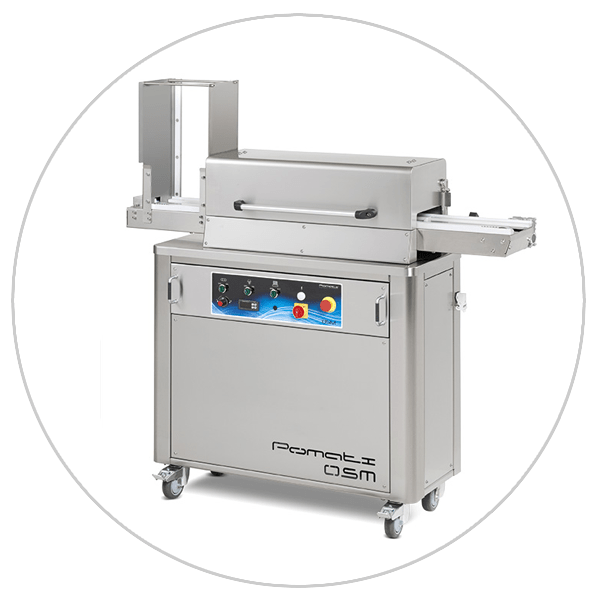 This slicer is perfect for wholesale bakeries, sandwich production facilities, or commissaries looking to slice a large volume of rolls. 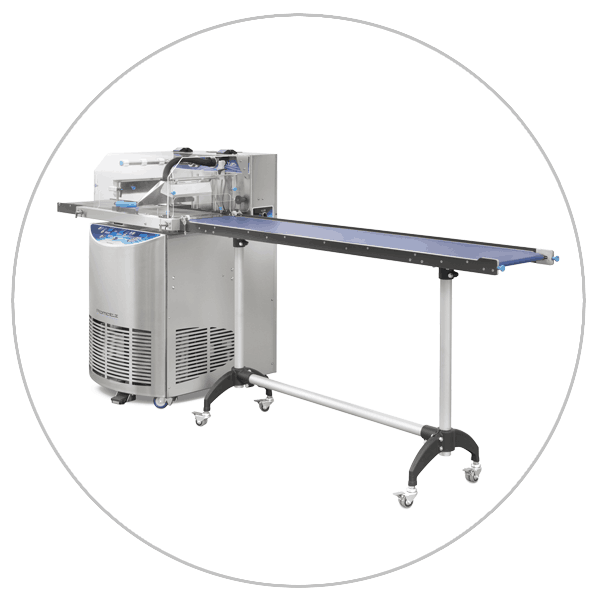 This slicer can also easily shift from hinge to complete cuts. 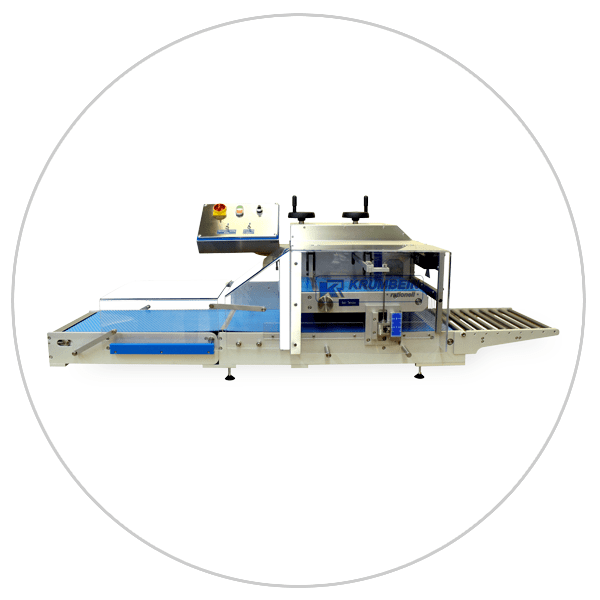 This slicer is perfect for making a complete cut into baked products with models capable of cutting up to 6 layers in a single pass. 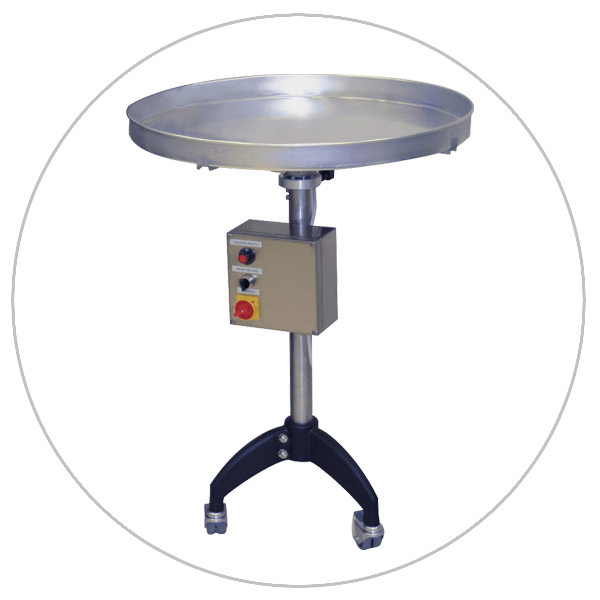 It can also used for cake slabbing! 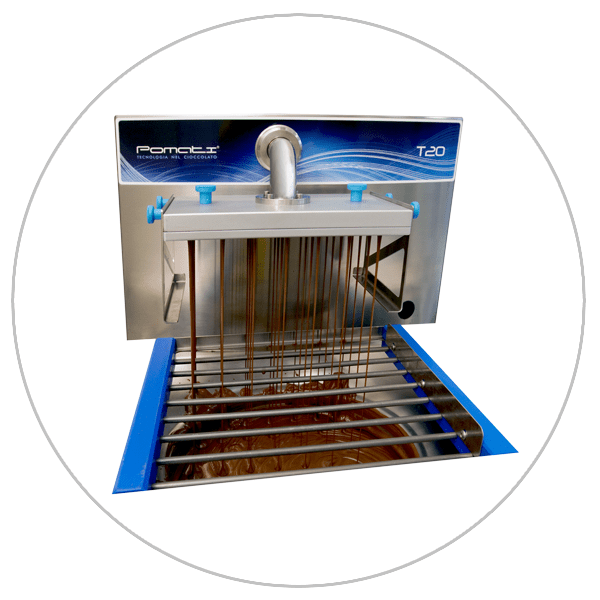 This slicer is perfect for slicing sheet cakes, brownies, and other linear shaped baked goods directly in their pan. 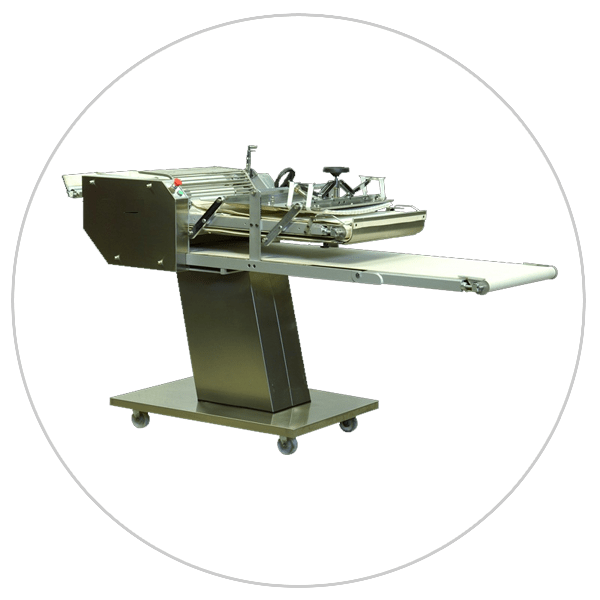 This slicer is perfect for slicing delicate pastries, cream cakes, napoleons and other baked goods in need of precision slicing. 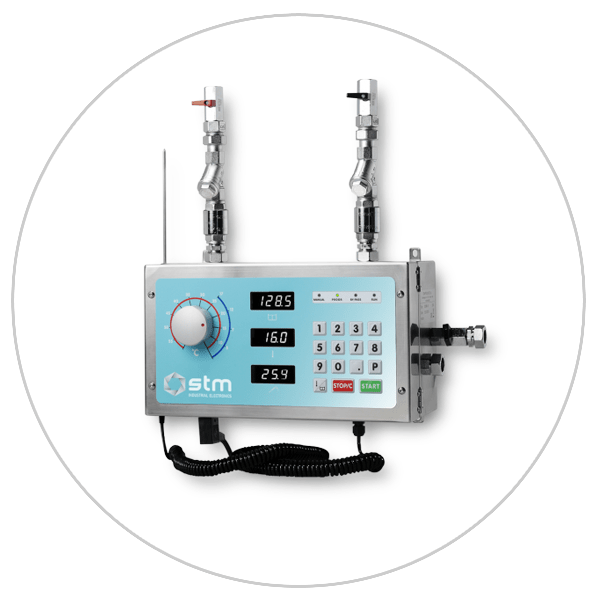 Innovative water dosing/water metering and mixing solution for retail and wholesale bakeries. 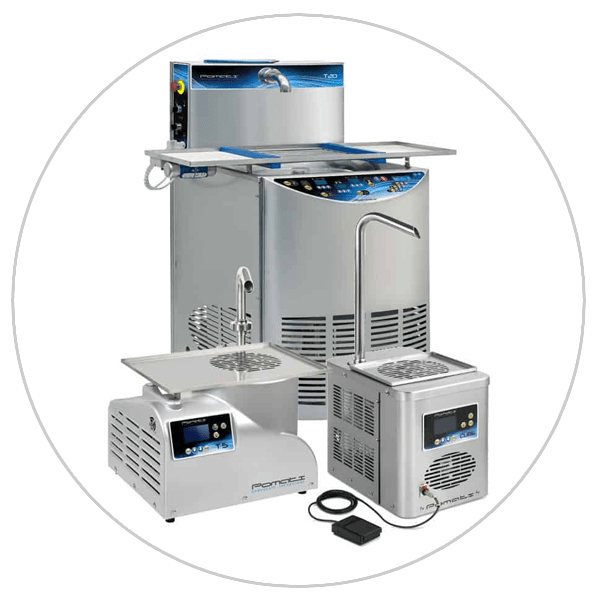 Highly accurate, energy efficient water chilling solutions.  We have comprehensive bakery equipment solutions for both retail/in-store & and wholesale/industrial bakeries.